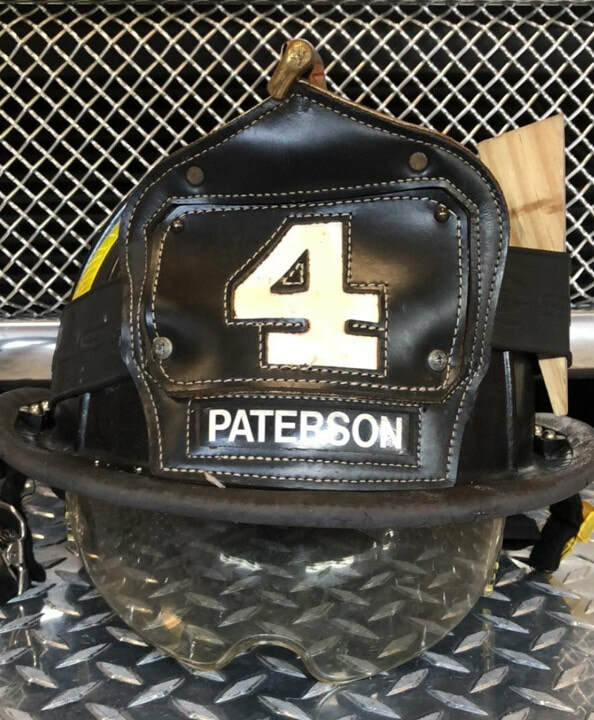 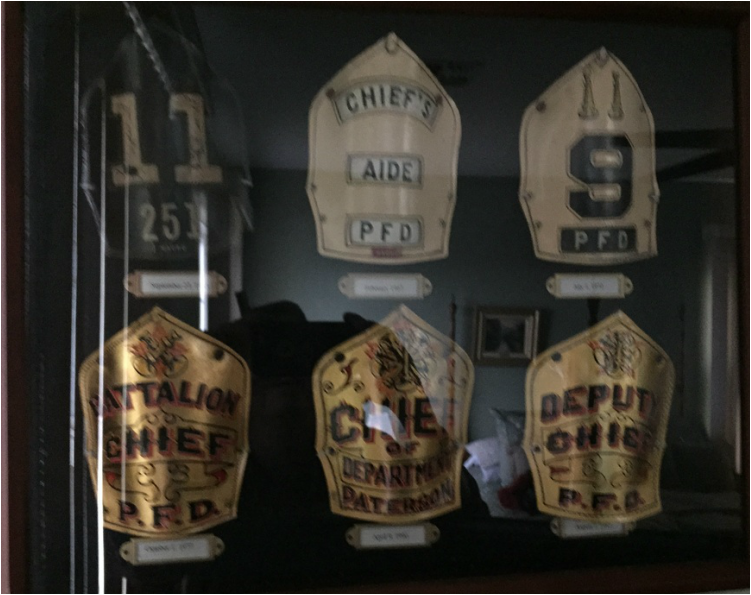 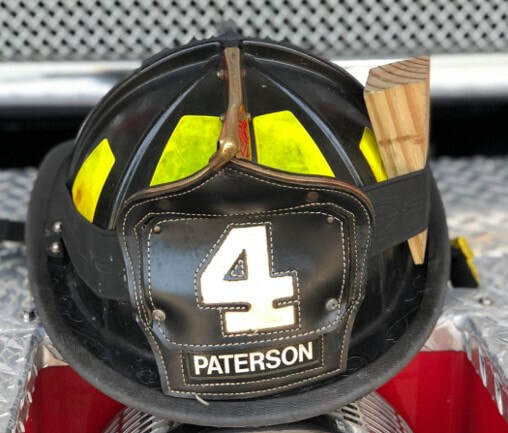 The following five helmets span the (37 year) career of one of Paterson's Chief Engineers, specifically Chief James Pasquariello. 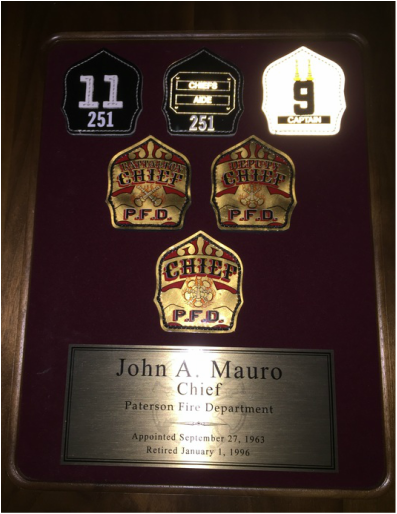 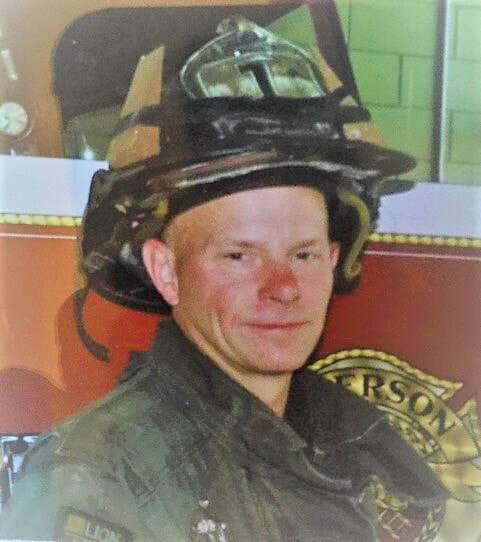 He served as a fireman on Truck 3 from 1968 to 1980. as a Captain of Truck 3 from 1980 to 1988, as a Battalion Chief from 1998 to 1994, as a Deputy Chief from 1994 to 1997 and as Chief from 1997 until retirement. 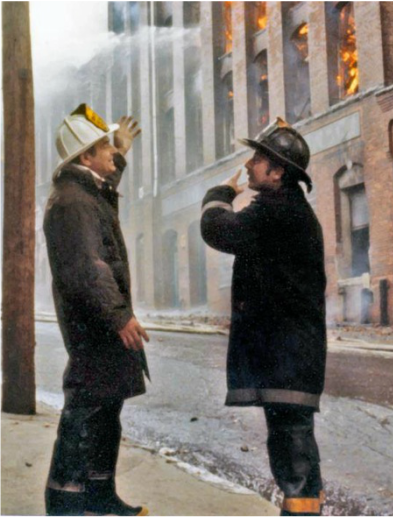 The eye shields were made mandatory in the late 1970s after an incident involving then 3 Truck fireman Bill Shortway. 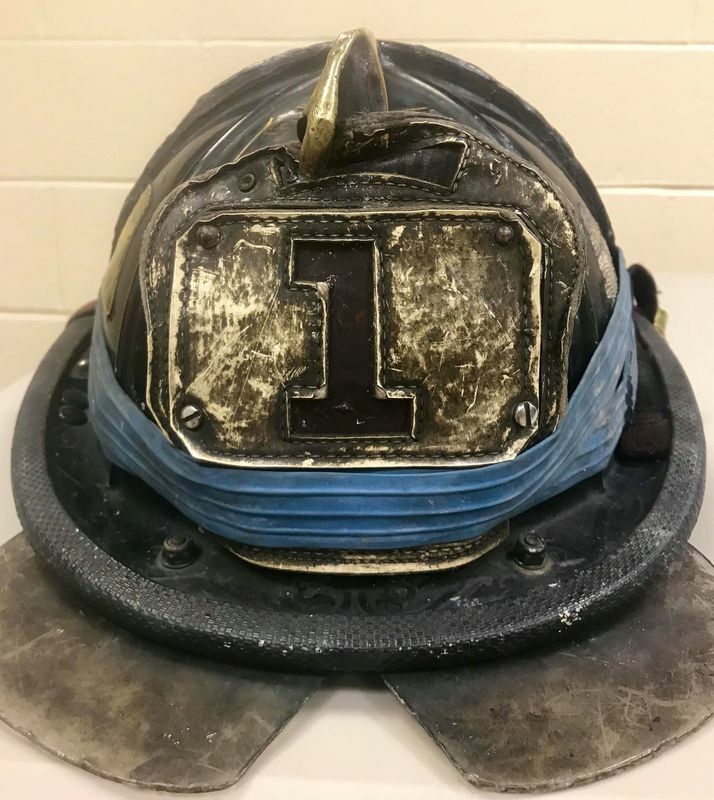 He lost the sight in his left eye after being hit with falling debris from a ceiling he was pulling during overhaul operations after a fire. 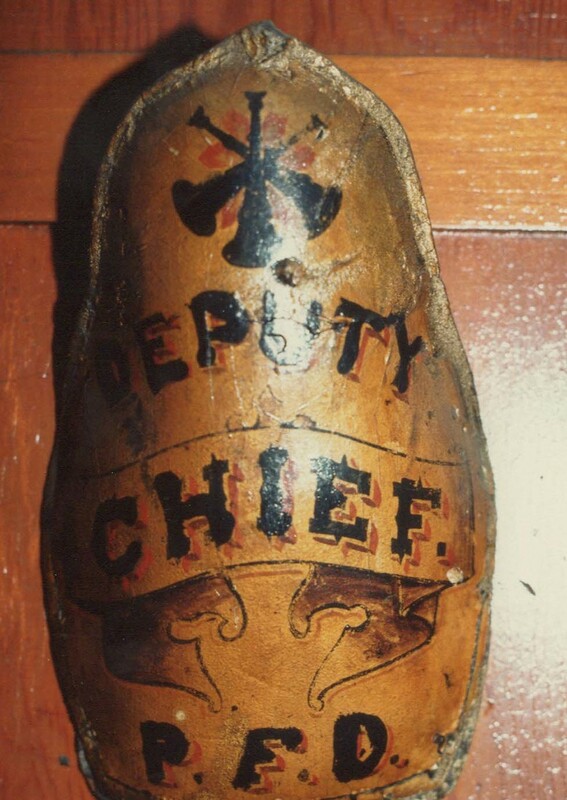 He later advanced to the rank of deputy chief. 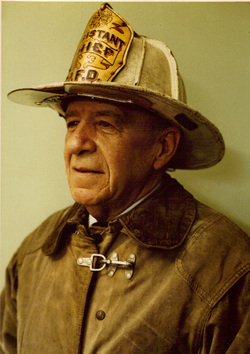 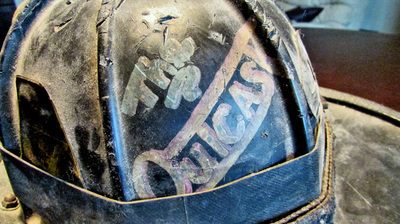 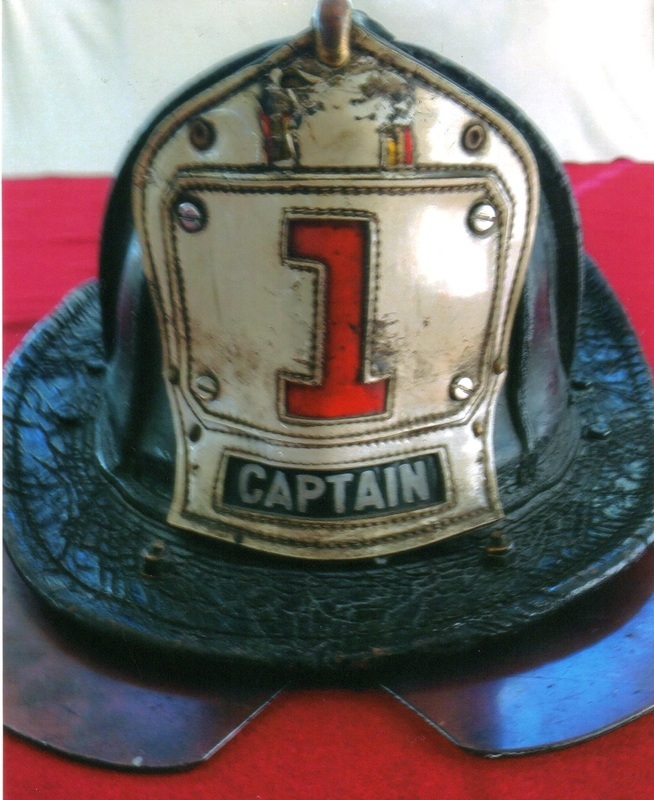 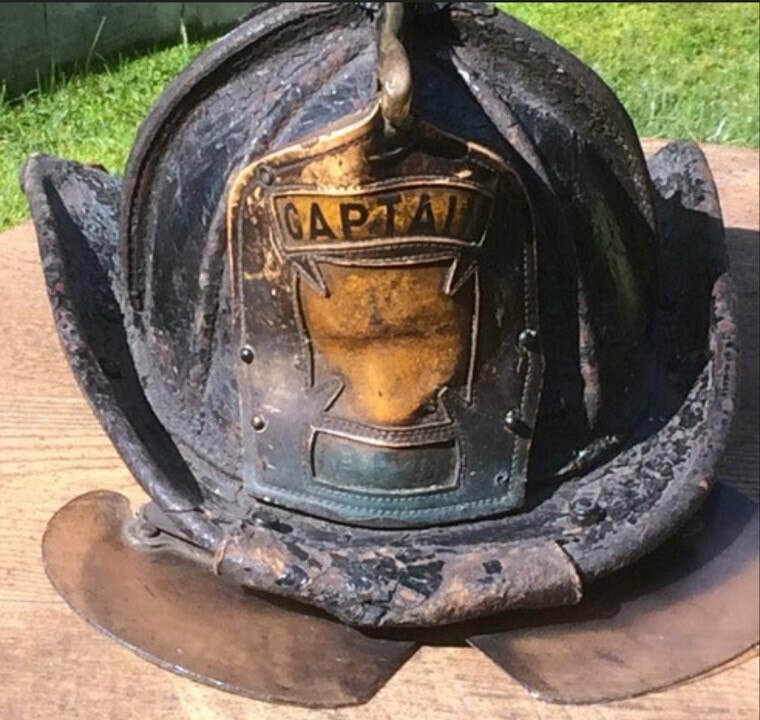 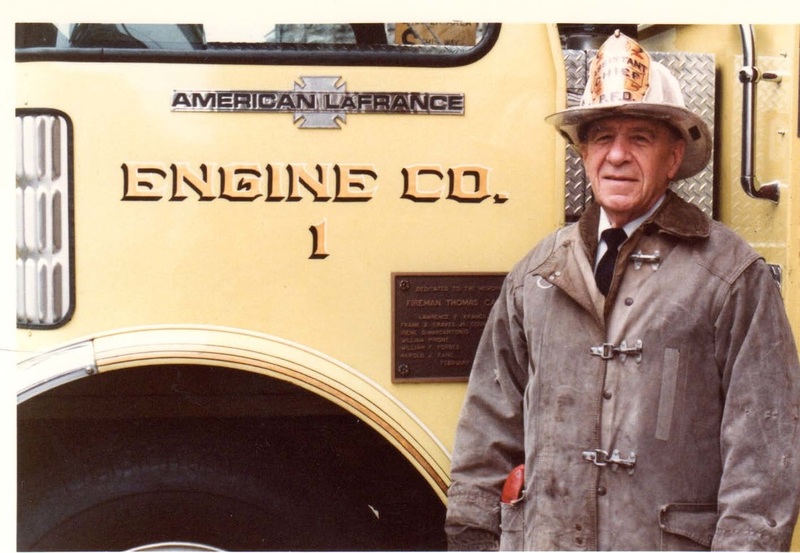 Captain Patsy Fusaro - ~1963 -1964"
Helmet of long time engine 2 Captain Albert "Hoot" Novick (1943-1968). 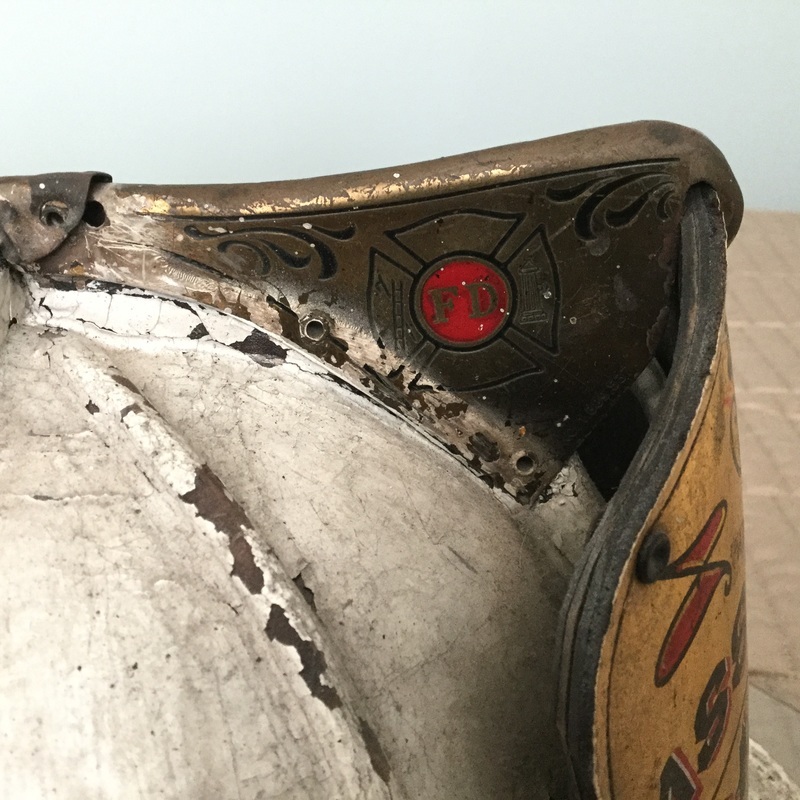 On the shield the left trumpet (captain's insignia) is worn off. 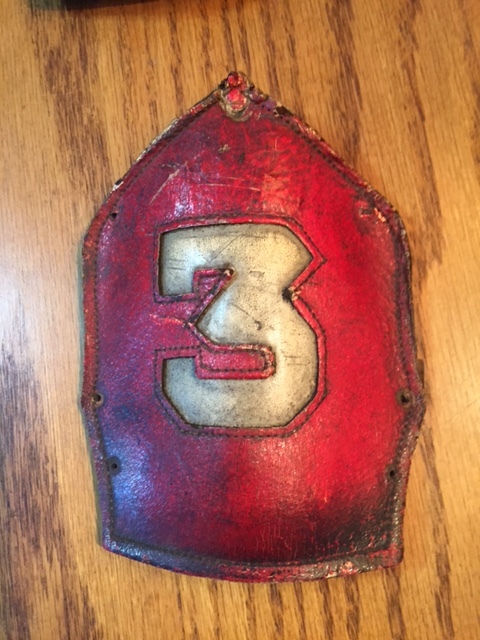 ​ Third Marine Division that Captain Conklin was assigned to during Vietnam. 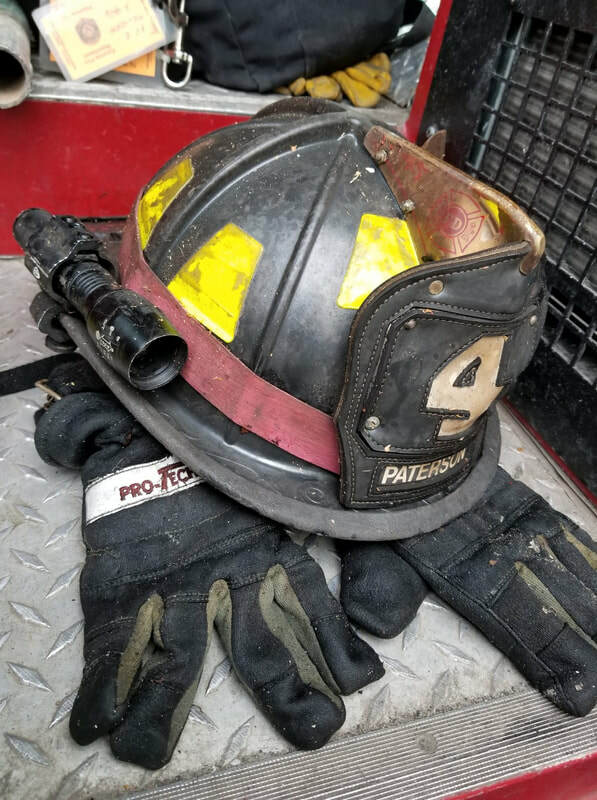 It was in the early 1990s the department started to replace the Cairns 5 A leather New Yorker with the Cairns 880 series plastic helmet. 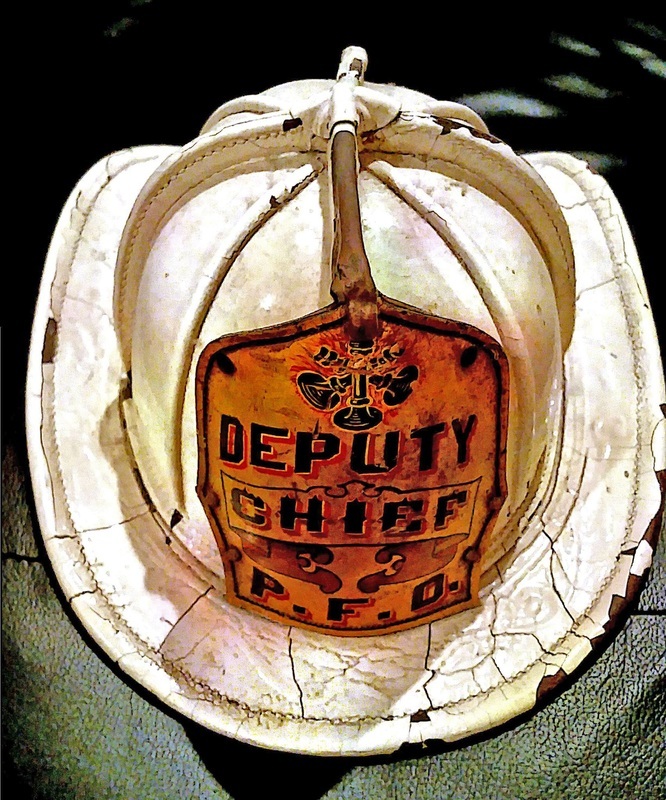 From there the department began to issue the Cairns 1010 reinforced plastic helmet. 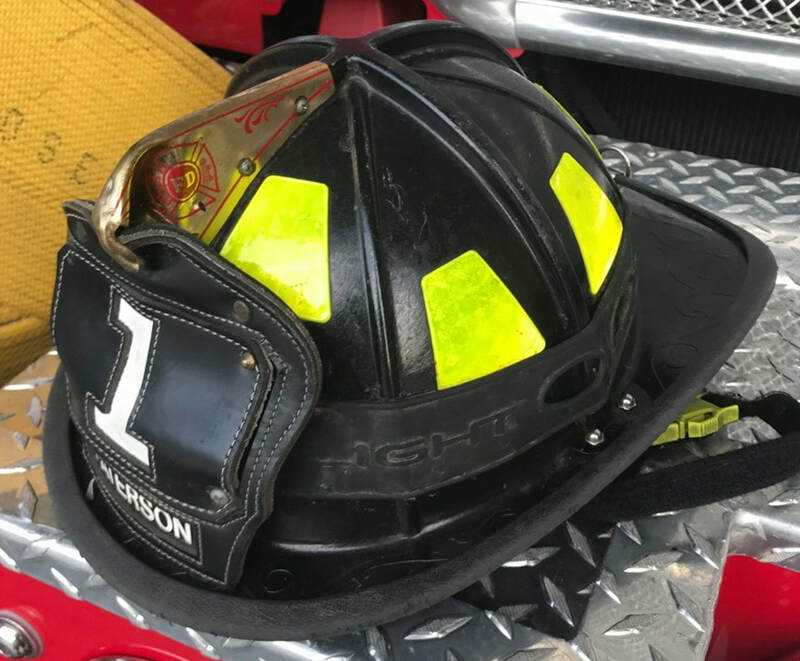 The newest helmet now being issued is the Cairns 1044 A it is a reinforced plastic leather look helmet with built-in goggles that are stored in the dome of the helmet that flip down when needed. 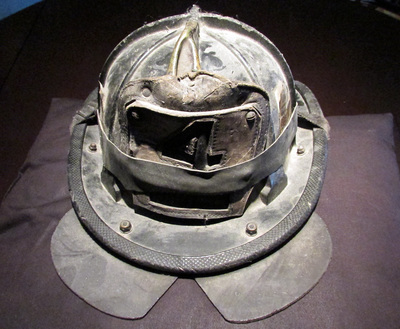 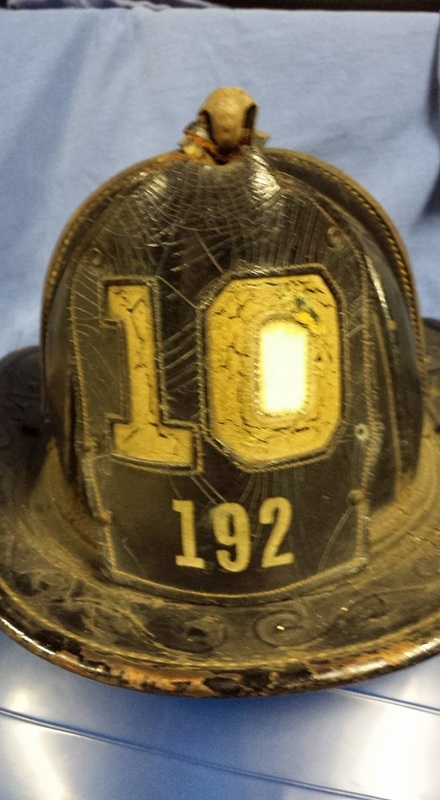 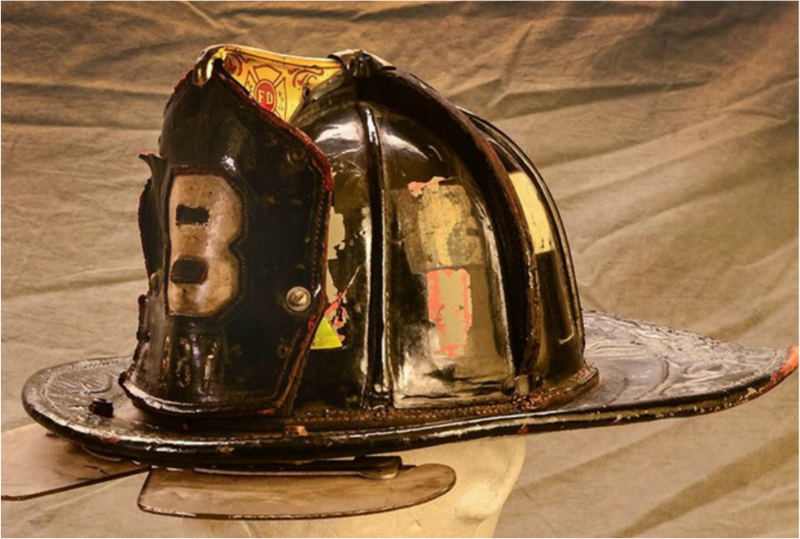 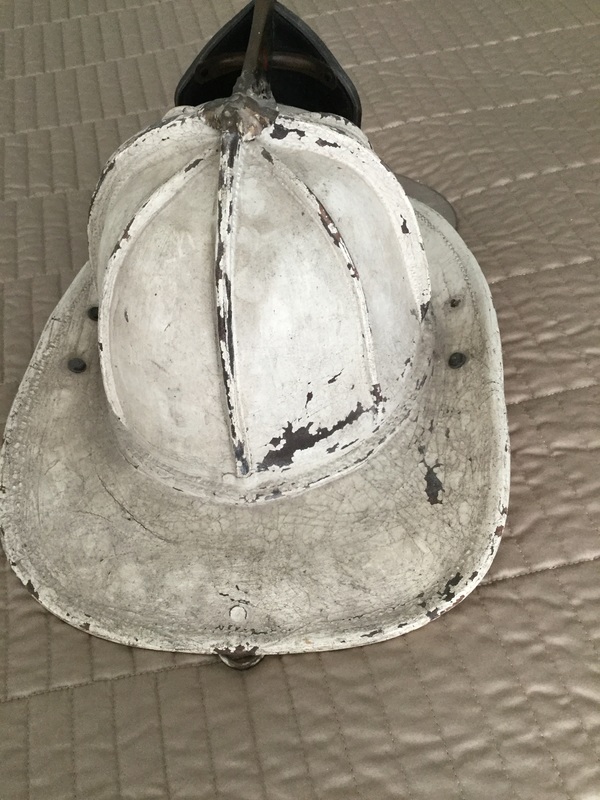 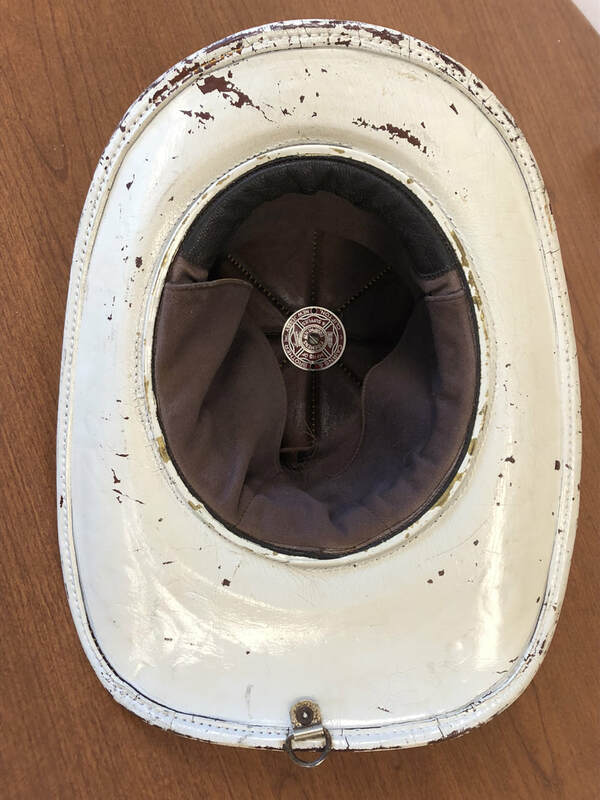 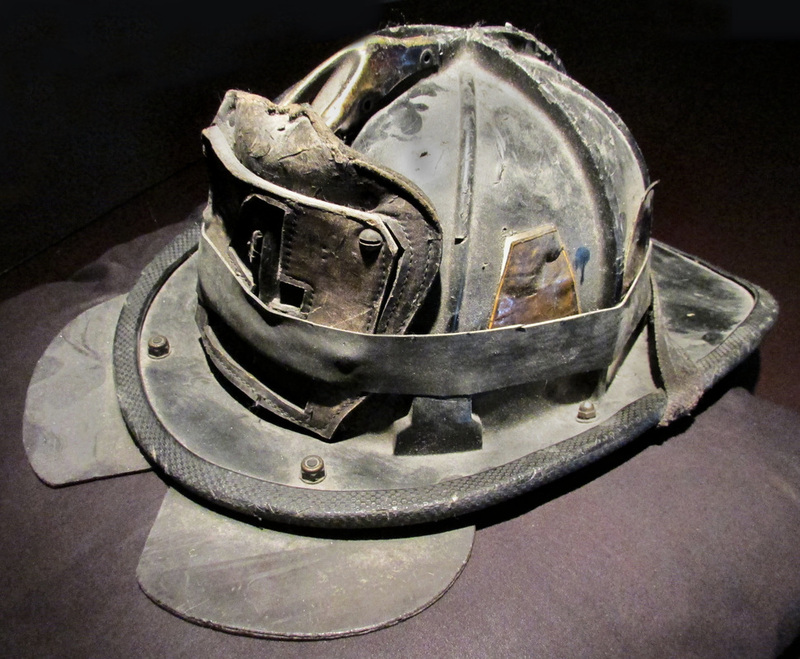 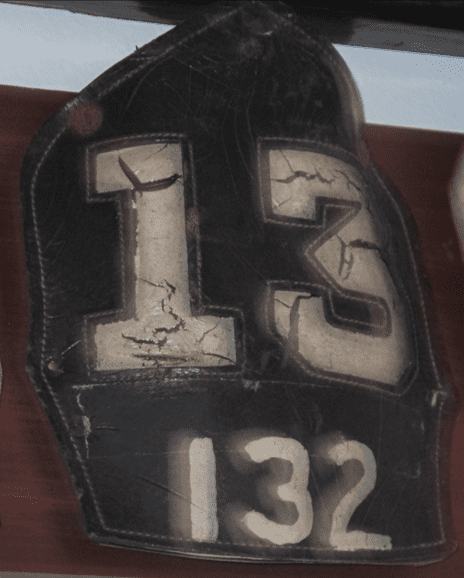 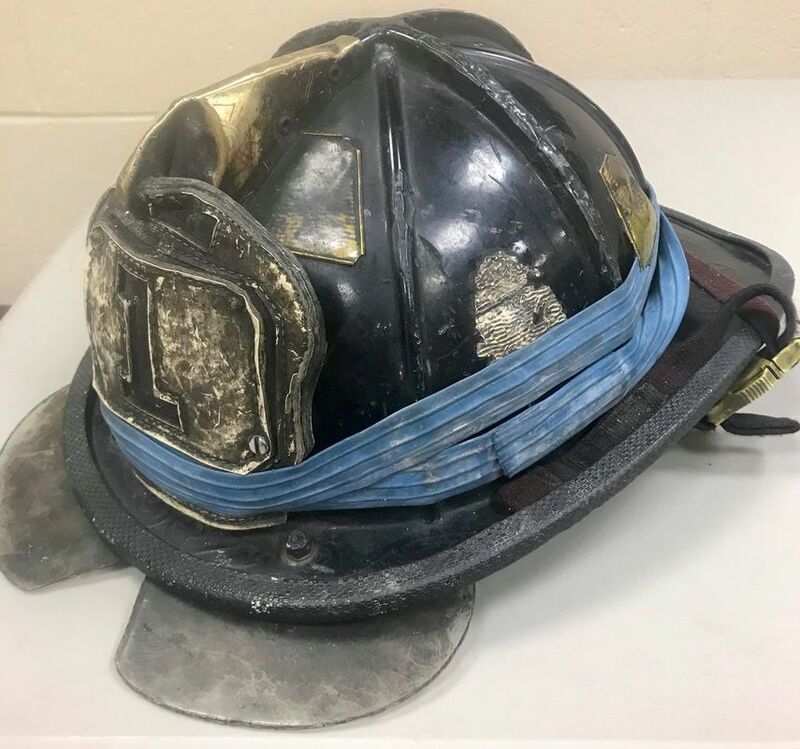 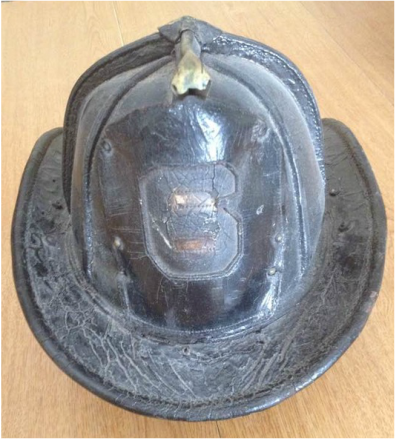 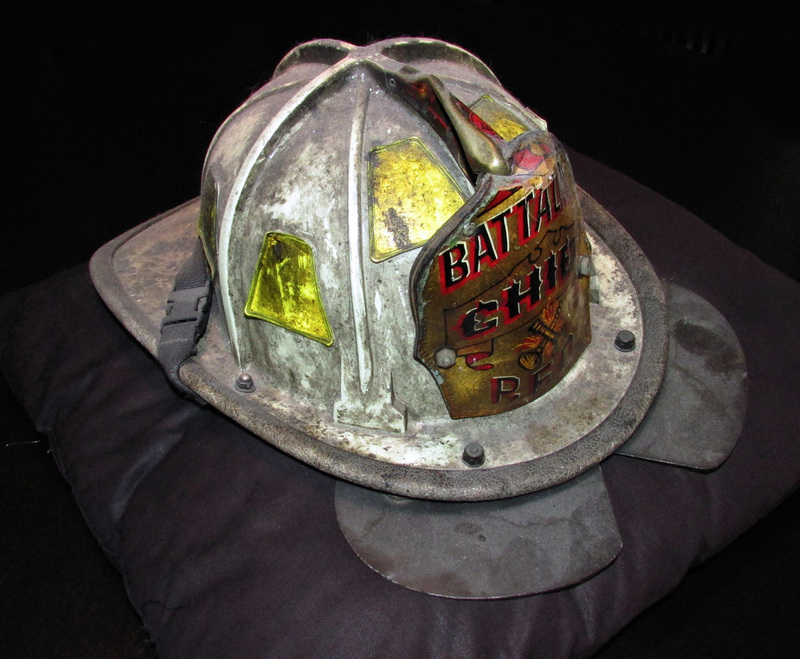 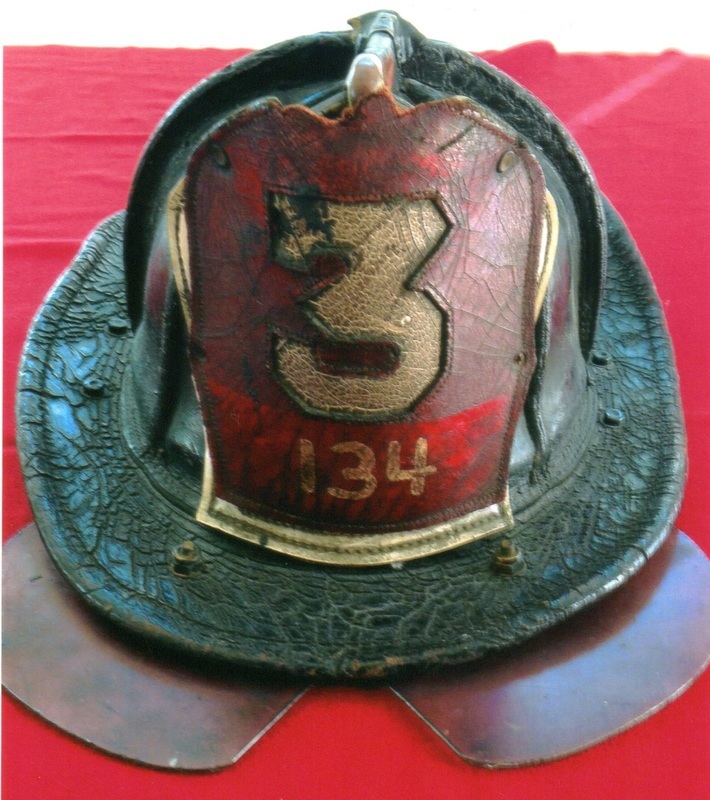 Below is the thermoplastic or composite NFPA approved helmet which was issued to Vince Marchese in the early 1990's showing eye guards and thermal neck protector. 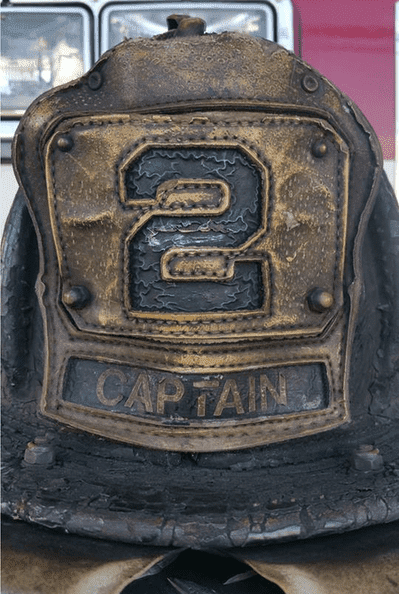 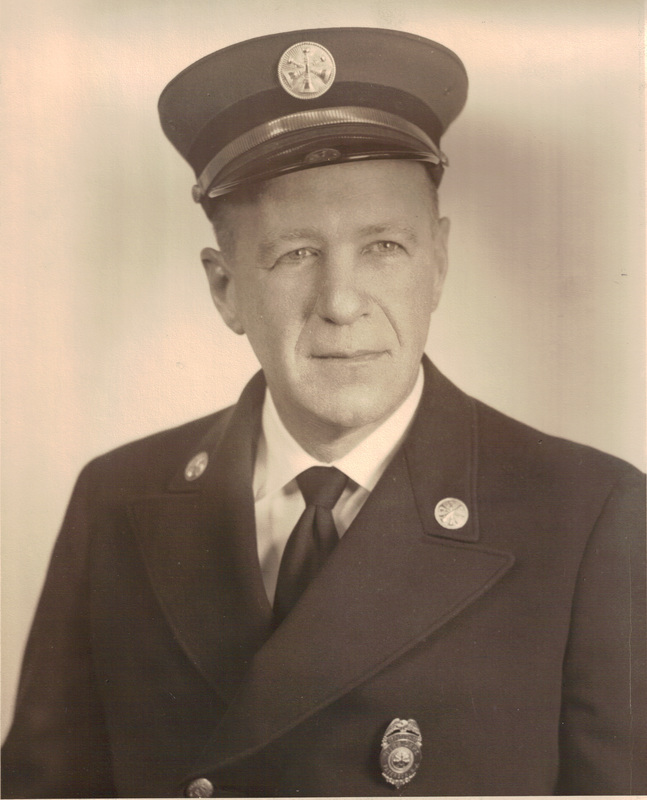 Well know and well respected Firefighter Joseph Parkin Sr. City of Paterson Fire Department badge # 231 was appointed December 1st 1957 and retired March 1st 1982. 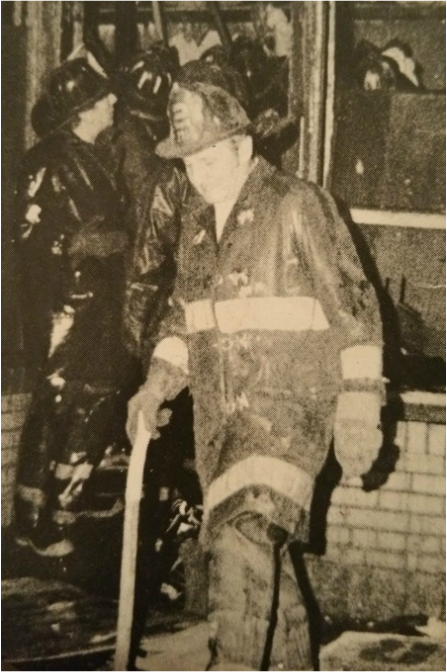 He served in Engine Company 3, B shift, from 1957 - 1969 and Truck Company 2, Tour 4, from 1969 - 1982. 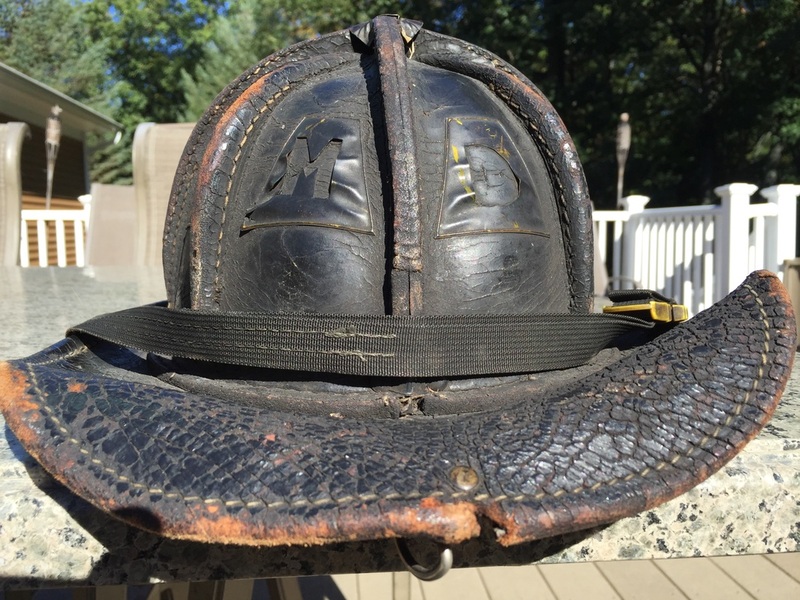 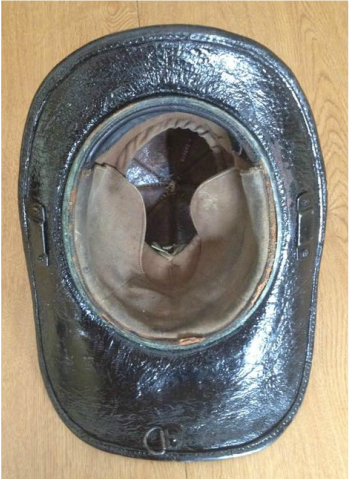 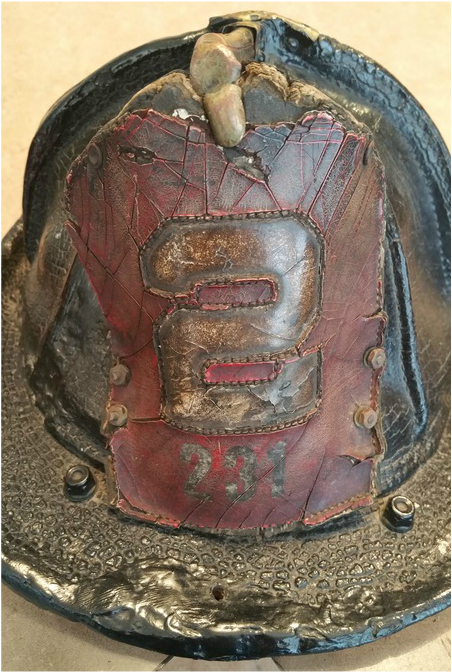 The helmet pictured is his Cairns leather he used for 27 years. 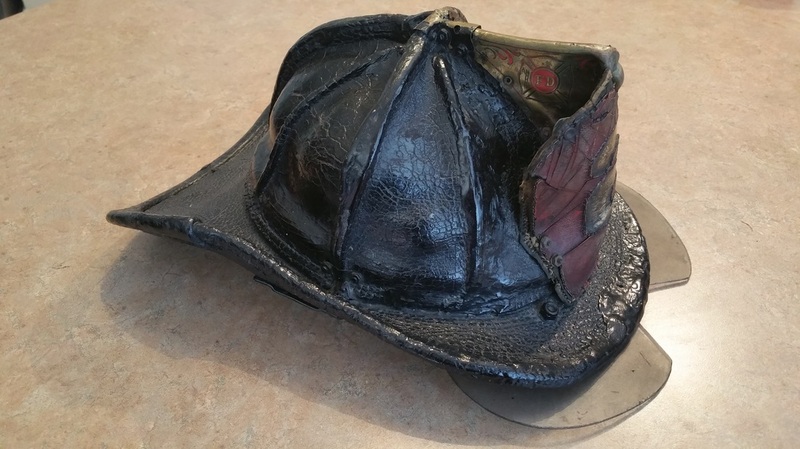 It was repaired several times throughout his career, at one point soaking it for nearly a week in water to reshape it and restitch it after it had been accidentally run over by 2 Truck at a tour change. 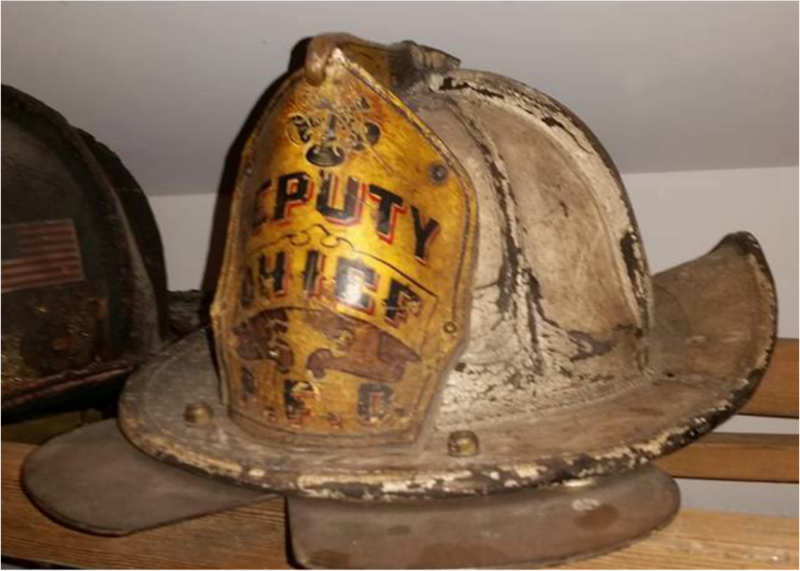 Like all helmets if it could talk it would have many interesting stories. 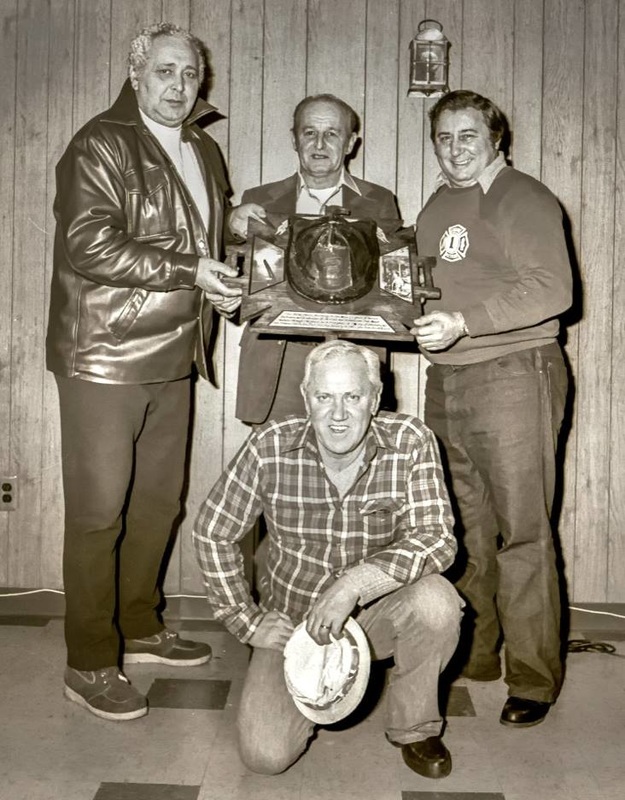 The fire scene photo, with Joe wearing the helmet is from 1978, a second alarm fire at Kings TV repair shop at the intersection of Ryle Road, West Broadway and Presidential Boulevard. 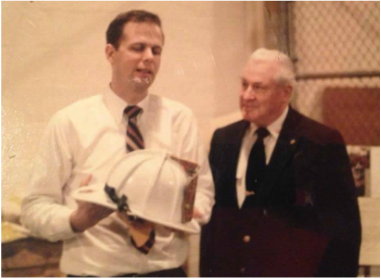 For more on Joe Parkin Sr visit the Notable Events Page, as a new Tower Ladder (2) was dedicated to his service at the new state of the art Fire Headquarters which was also officially opened at this ceremony. 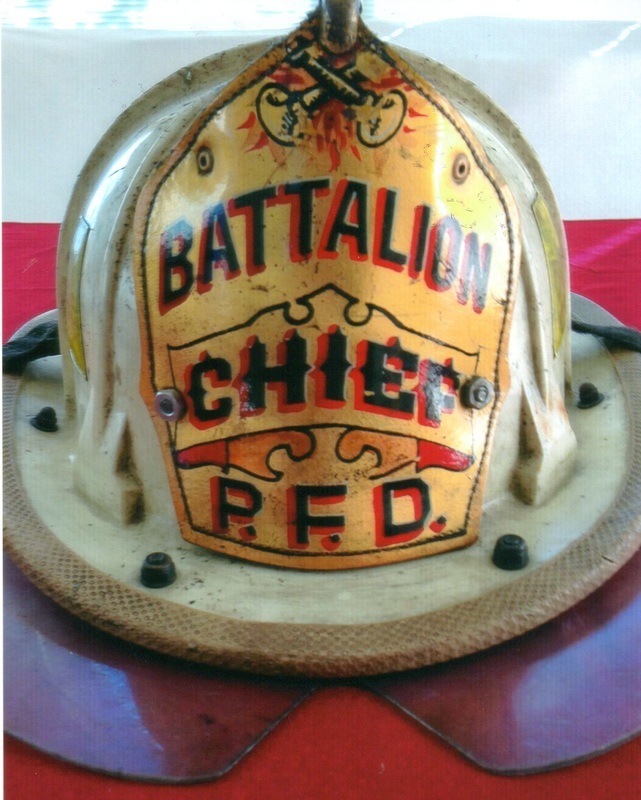 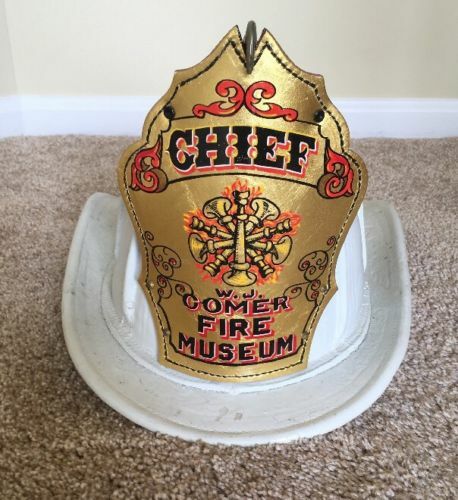 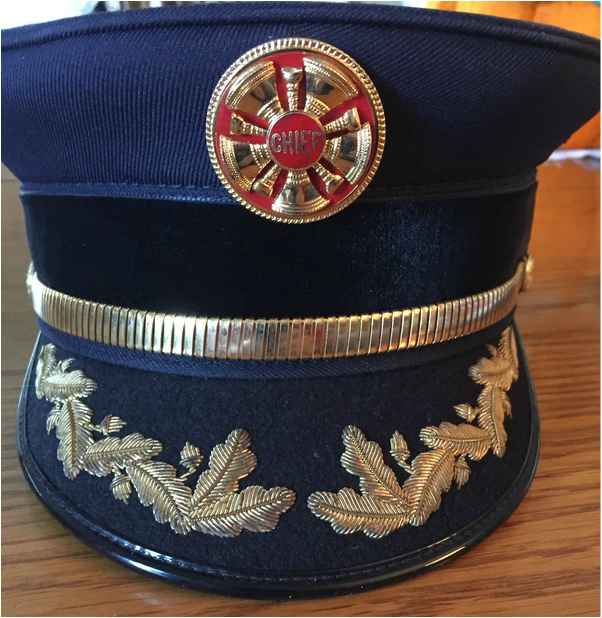 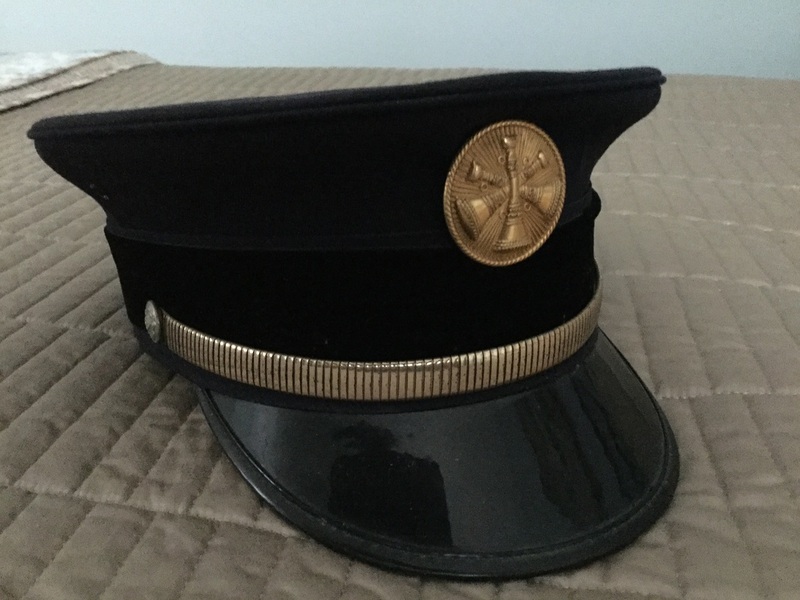 Helmet of John B. Murphy: Appointed July 1, 1916 - Driver for Battalion Chief Nolan February 1, 1918 – Driver for Chief of Department May 18, 1926 – Retired April 1, 1957.Note the high Eagle Finial and the increased height of the shield, so typical of that era. 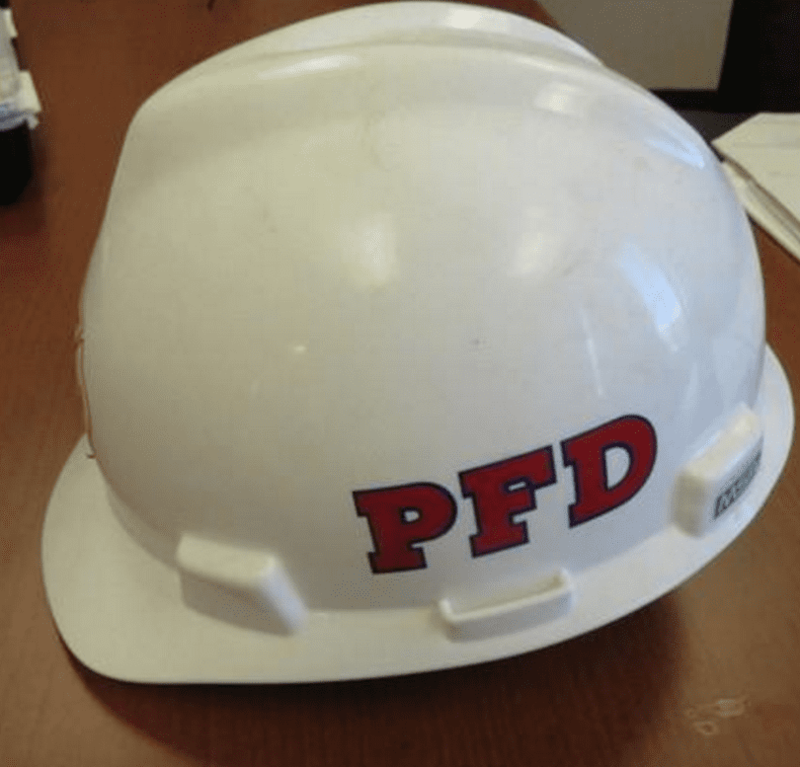 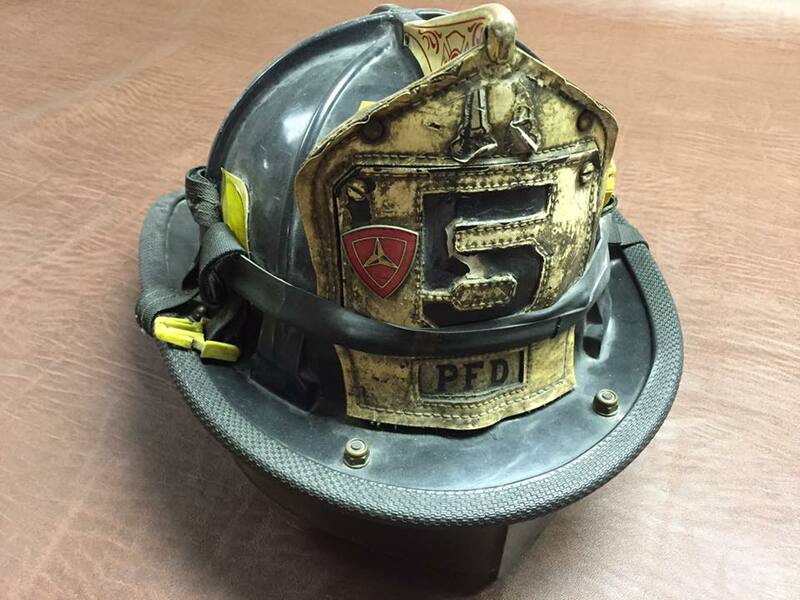 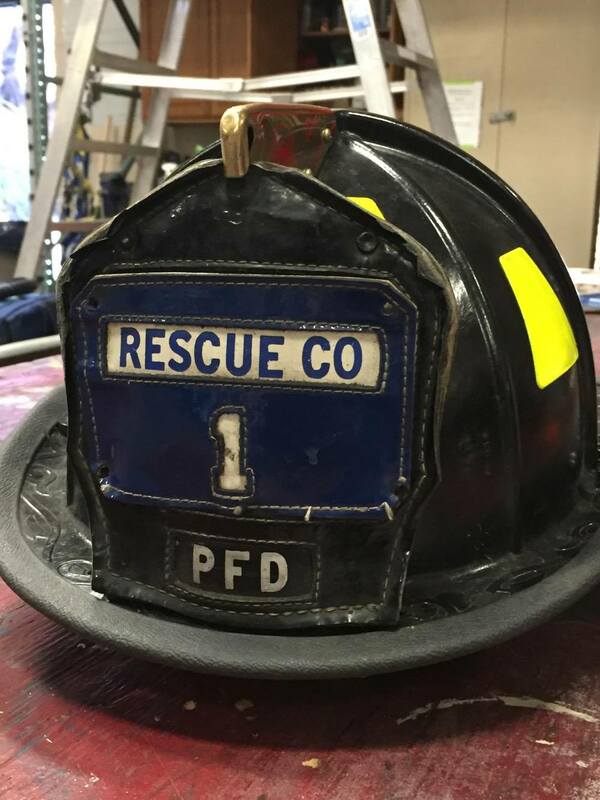 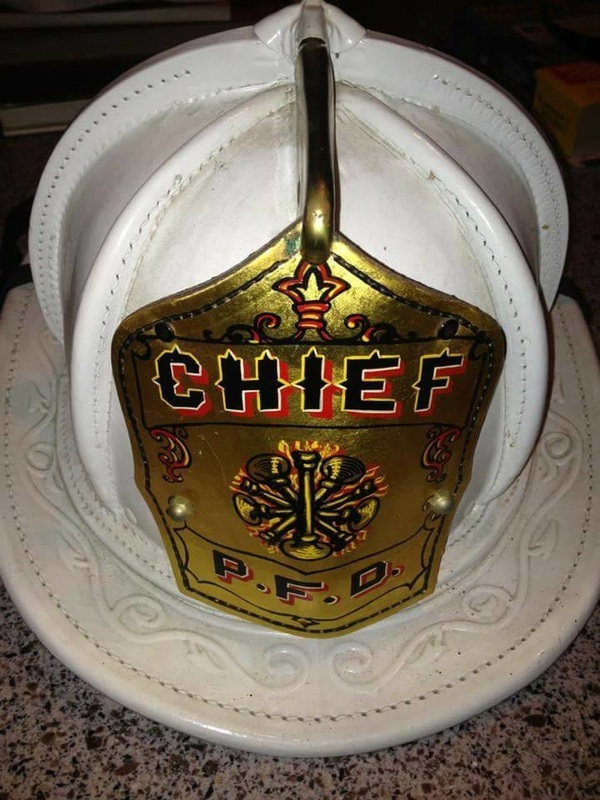 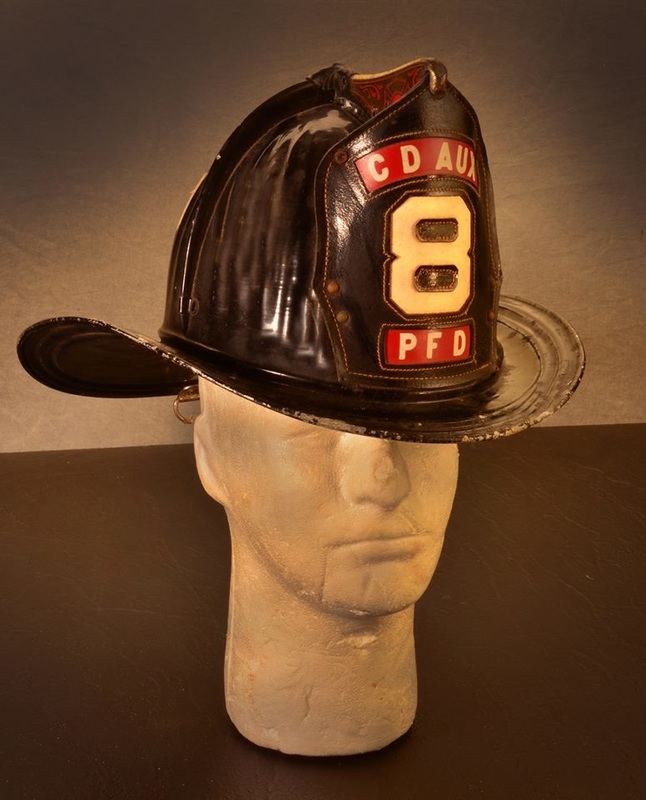 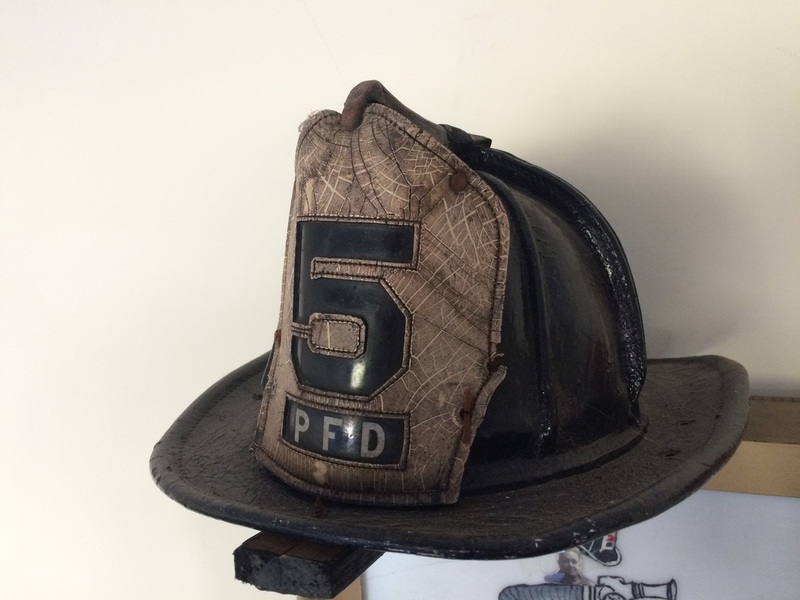 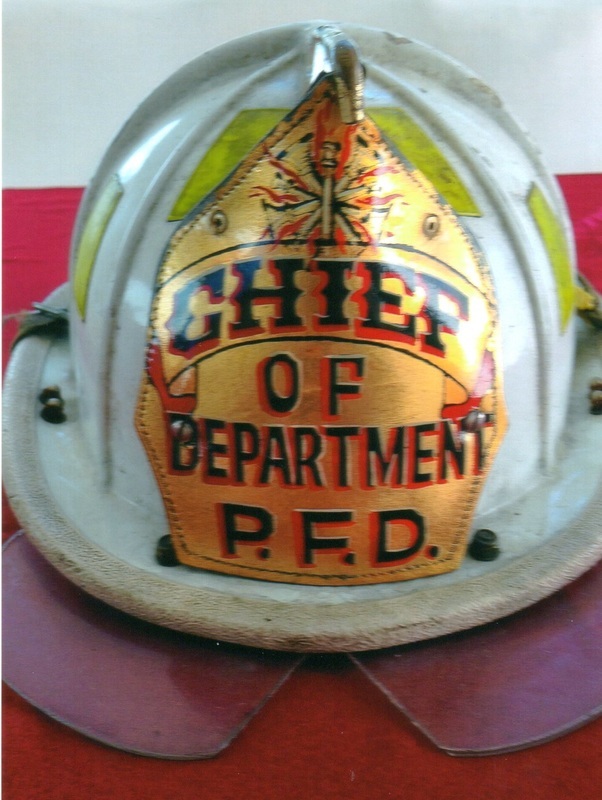 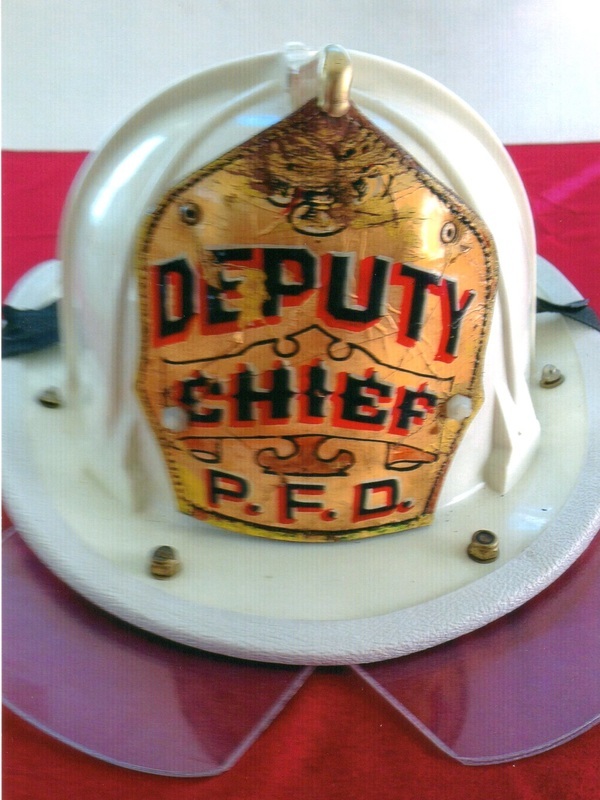 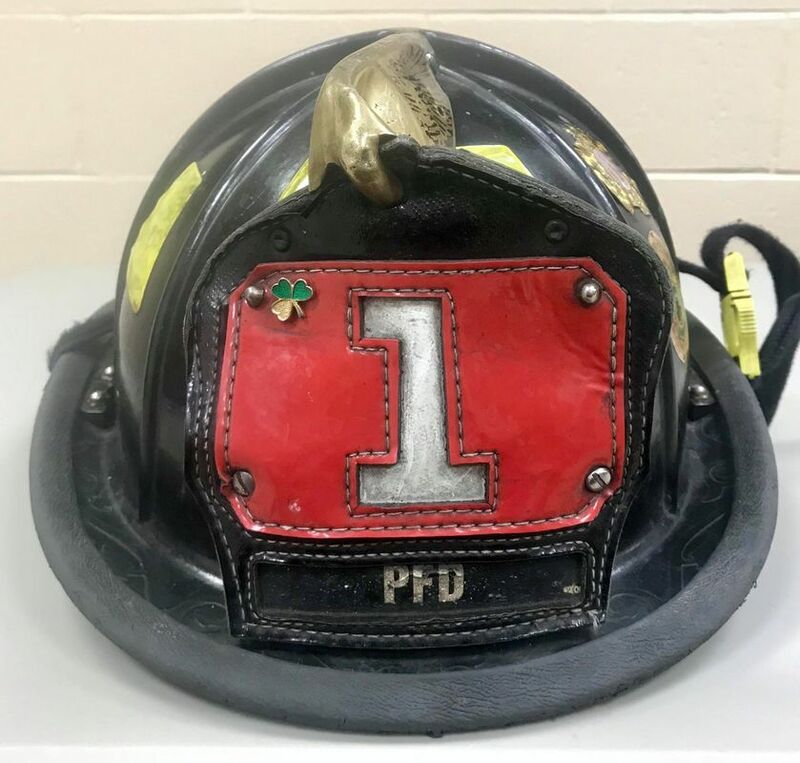 PFD CD Auxiliary aluminum helmet. 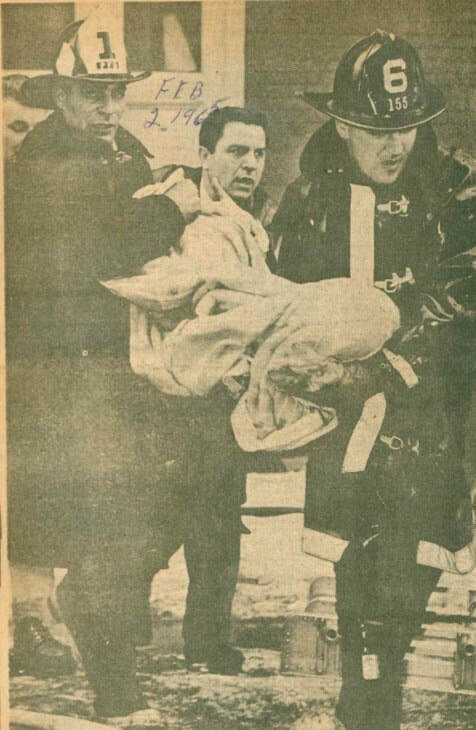 Cairns & Brothers. 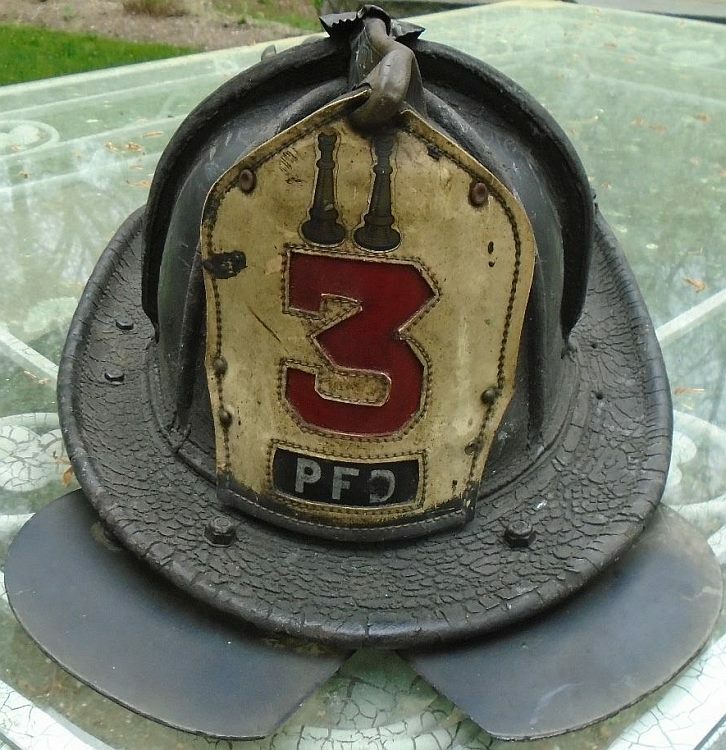 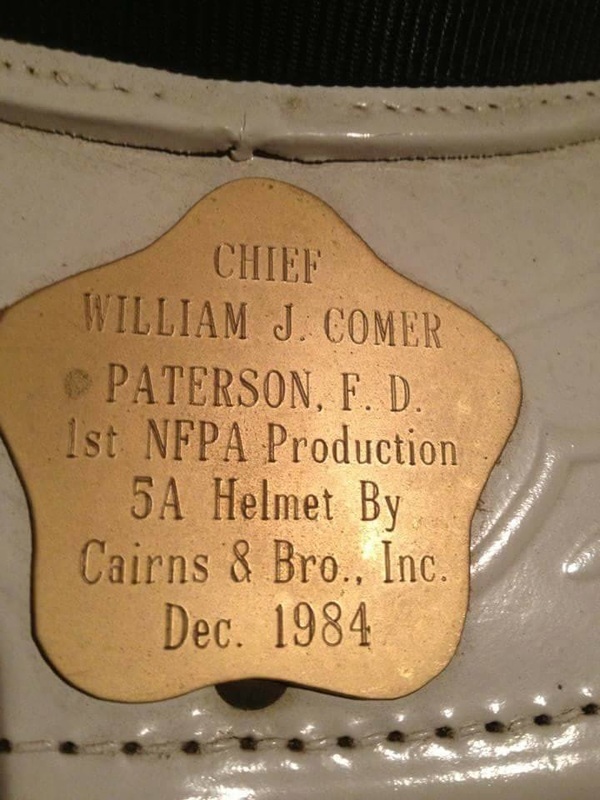 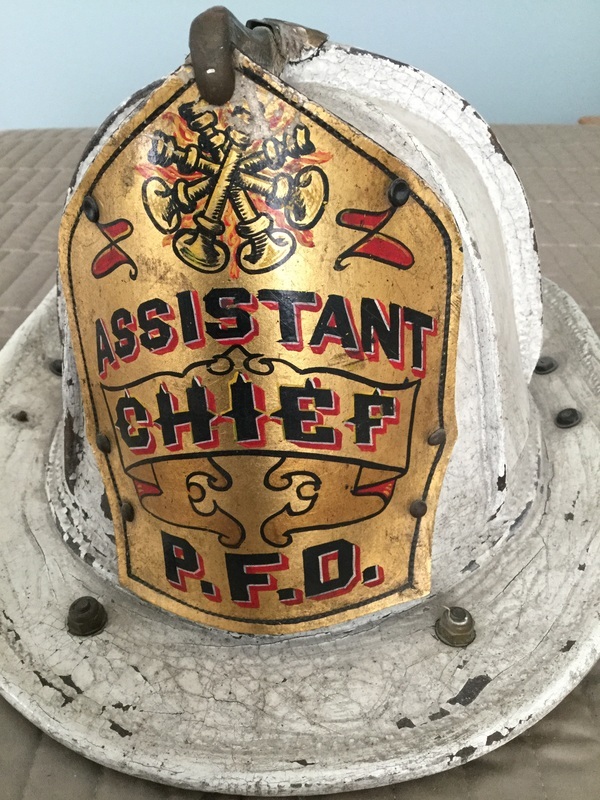 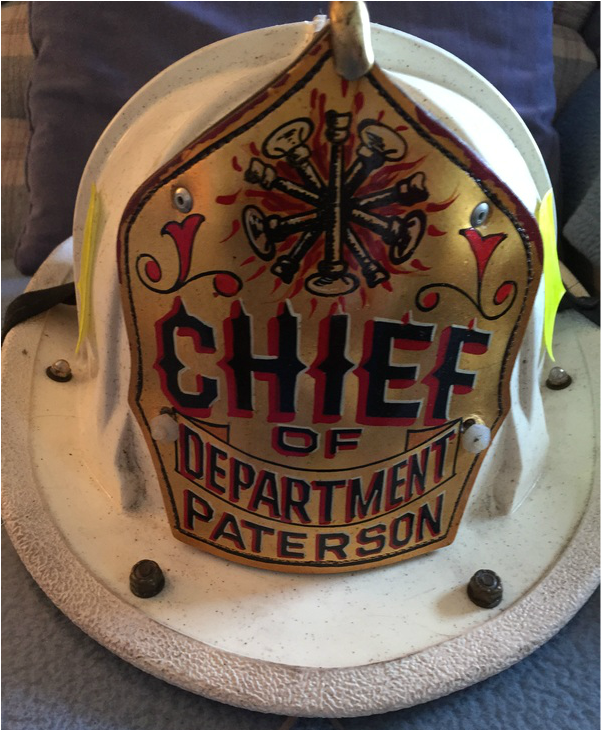 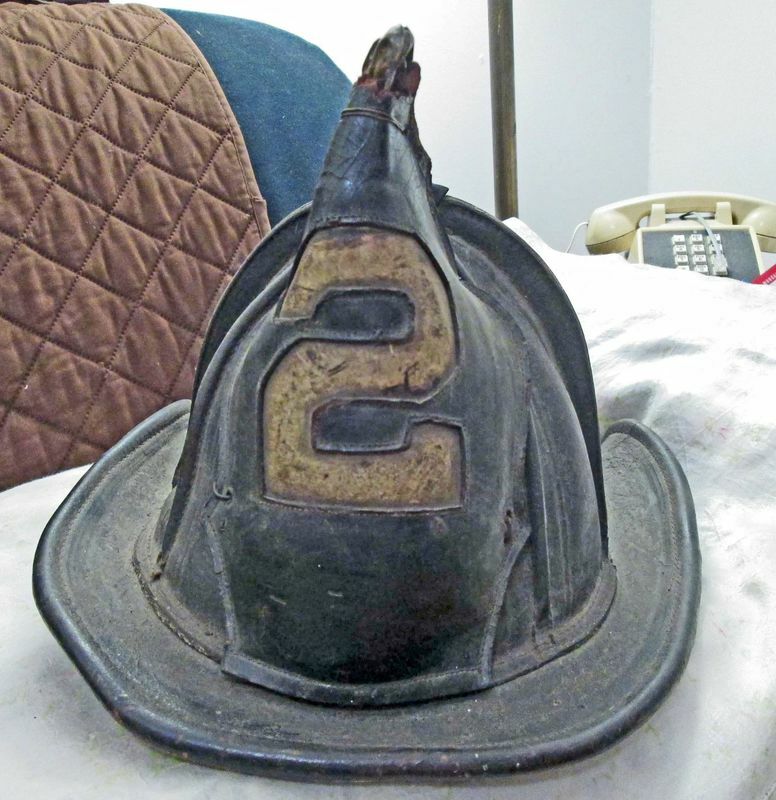 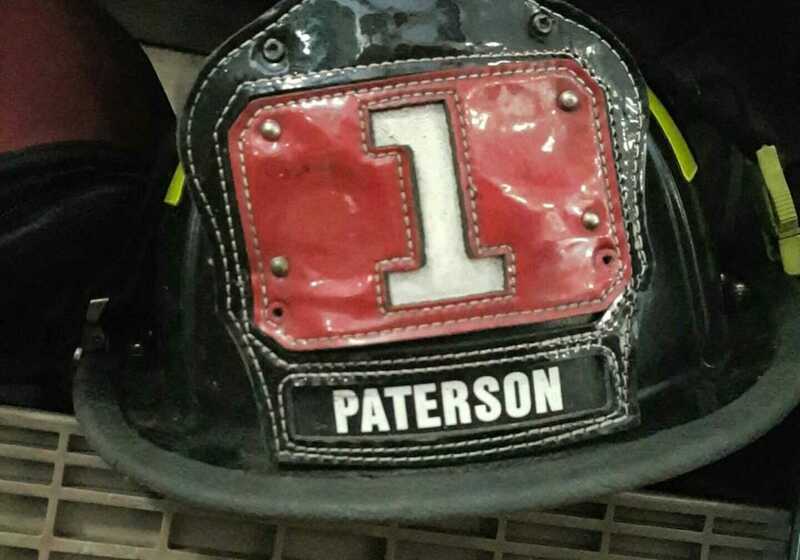 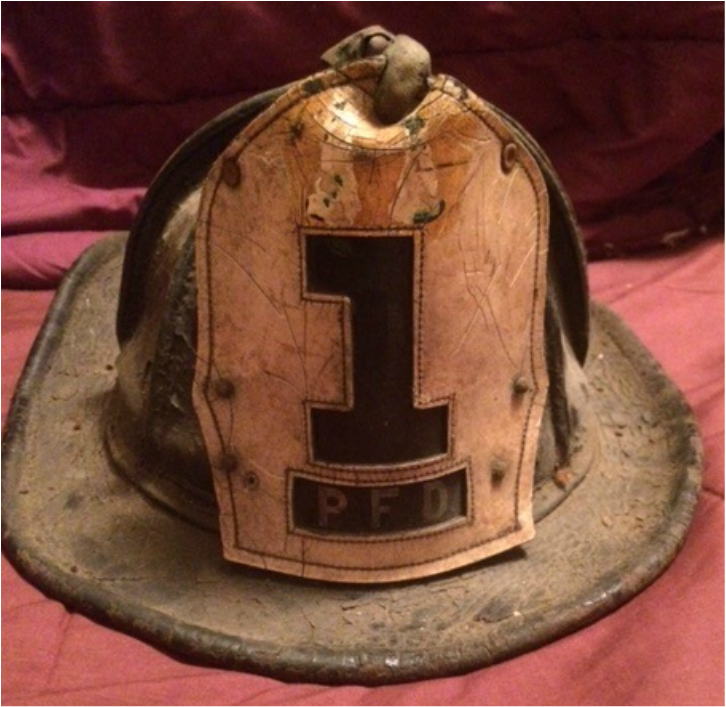 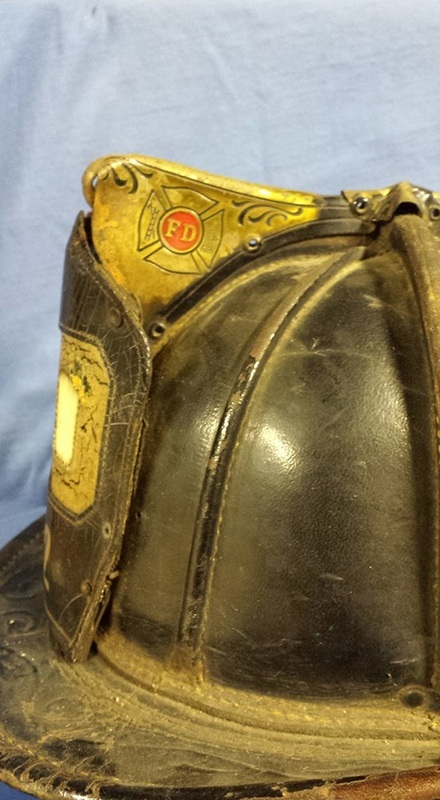 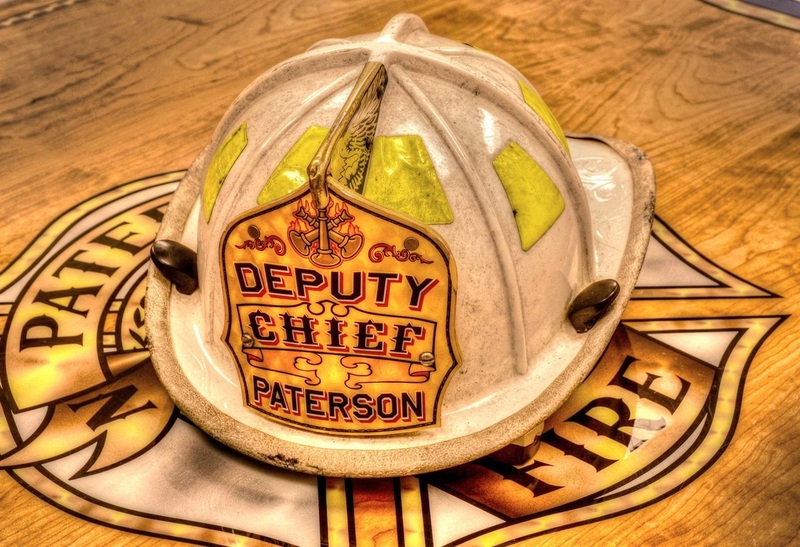 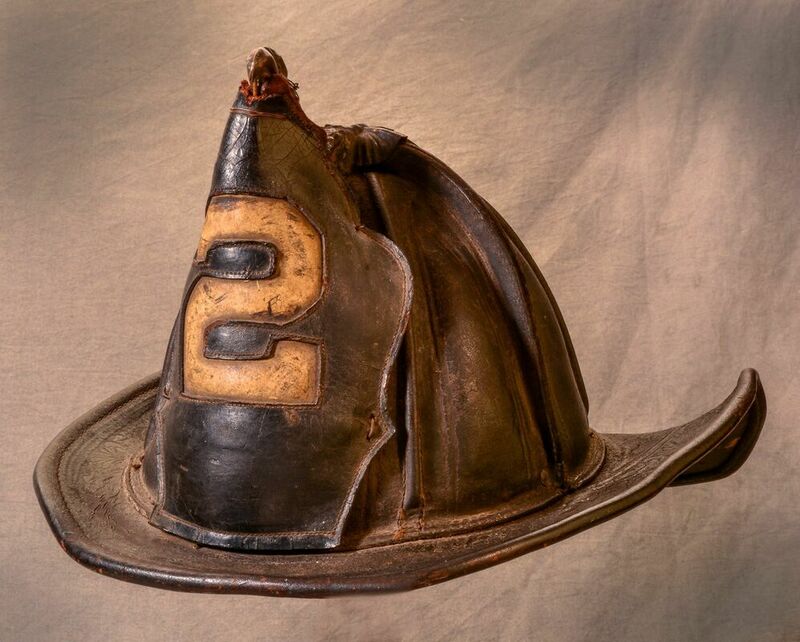 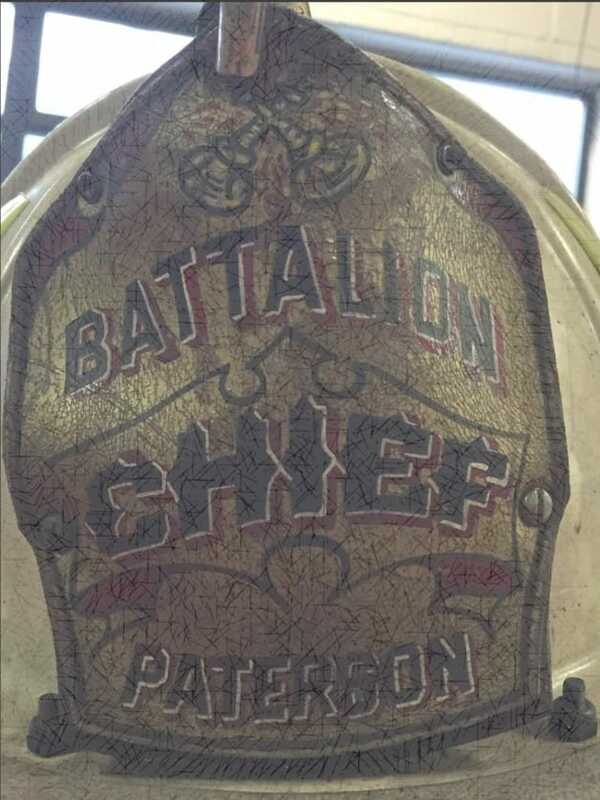 Paterson issued these helmets for their Auxillary Fireman from the 1940's right through the early 70's. 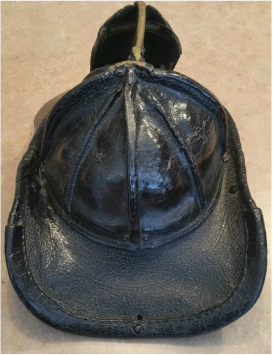 In the 1970s most quickly replaced them with the leather style New Yorker. 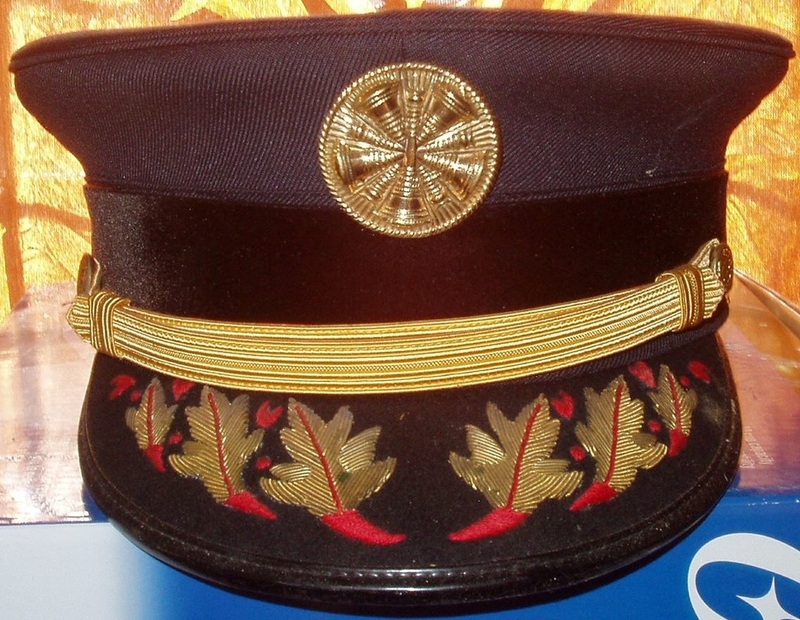 From the 1893 Rules and regulations book: For all members of hook and ladder companies, same as for officers of hook and ladder companies, omitting the insignia of rank, and except that the front will be of red patent leather with the number of the company on a back-ground of white patent leather, and the registered number of each member in white figures, one inch long, painted on a line below. 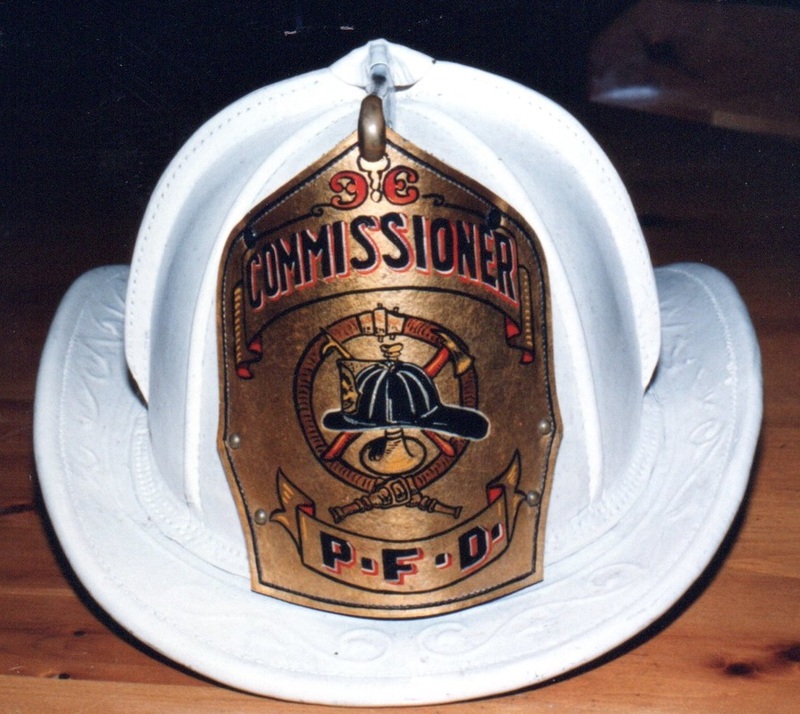 For officers of Truck companies, the shield will be of red leather, and have a white patent leather stitched front, with the number of the company cut out of it near the bottom in plain block figures, on a background of red patent leather (three and one-half inches long, if it be a single figure, and two and one-half inches long, if it be a double figure), and with the insignia of rank above it in gold, shaded with red. 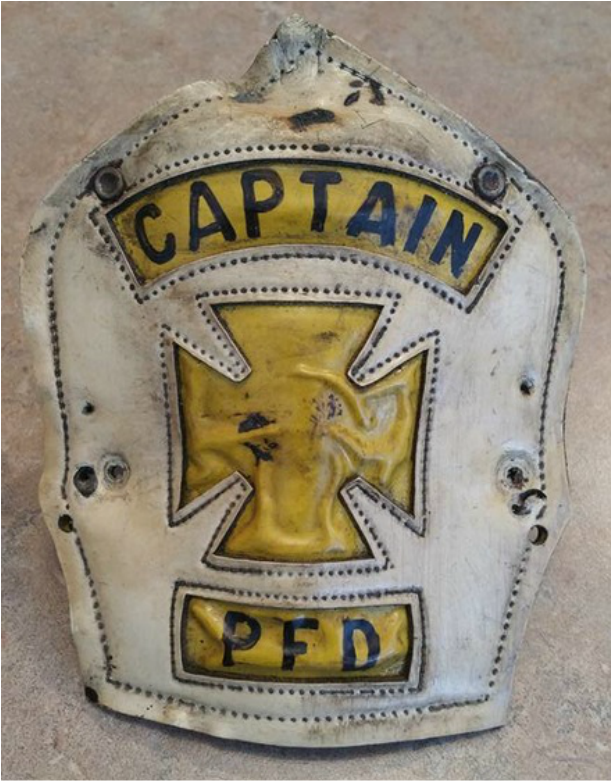 Floating Captains Shield: A vintage and rather rare Paterson Fire Department "floating" Captain's shield circa 1970's. 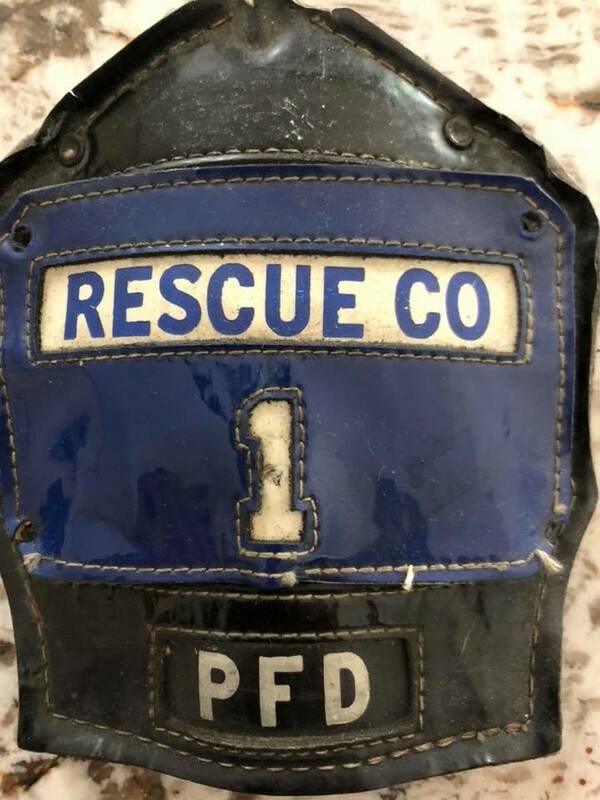 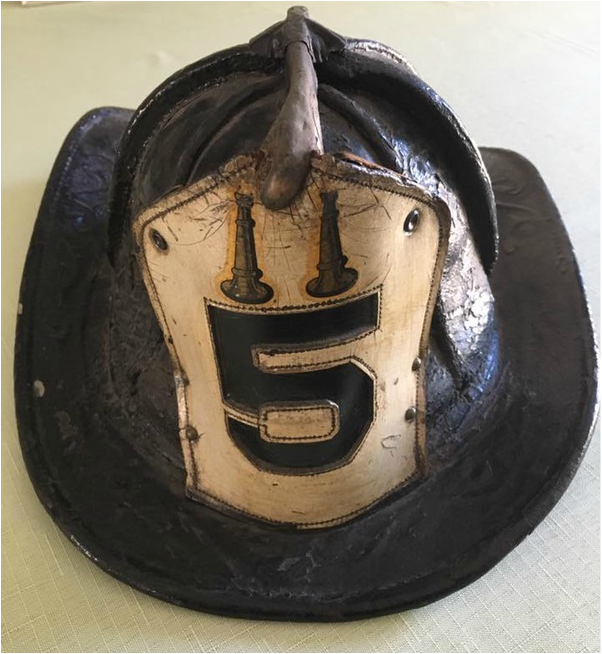 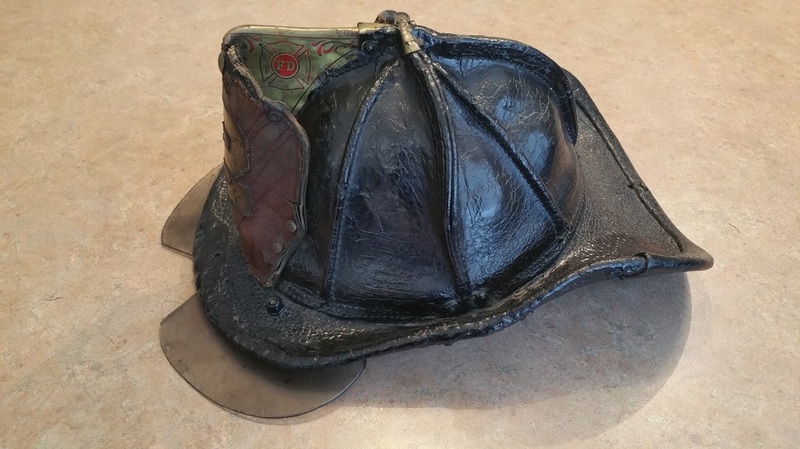 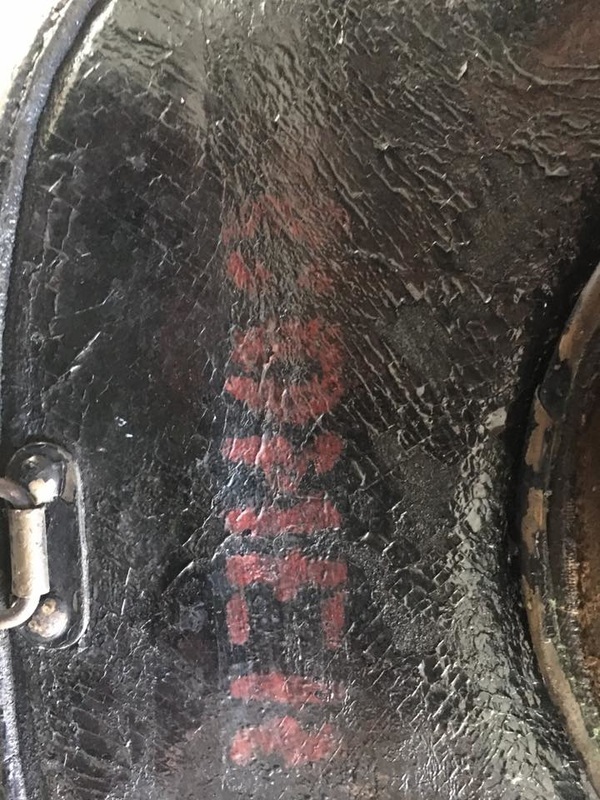 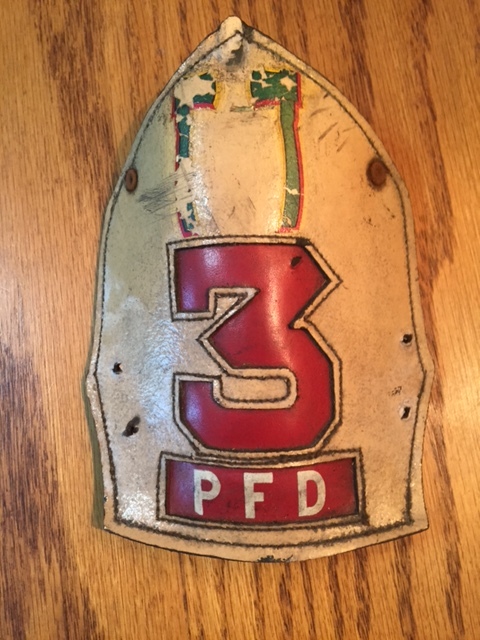 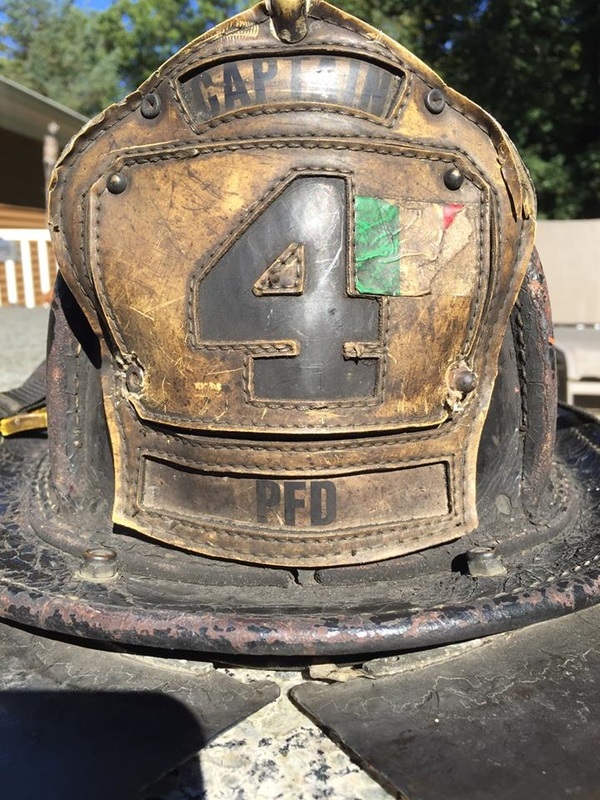 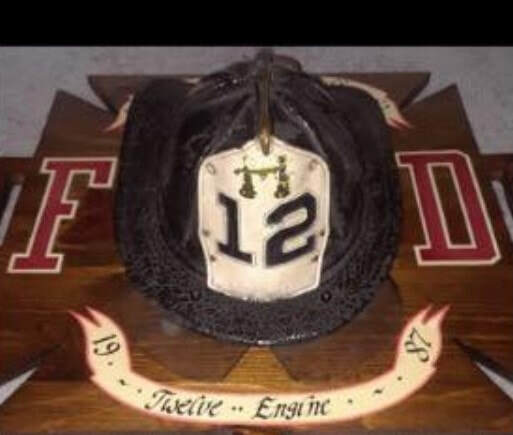 It was originally used by Captain John Minardi many years ago and then passed to Scott Parkin who had the privilege of using it before being assigned to Engine Company 6 and Rescue Company 2. 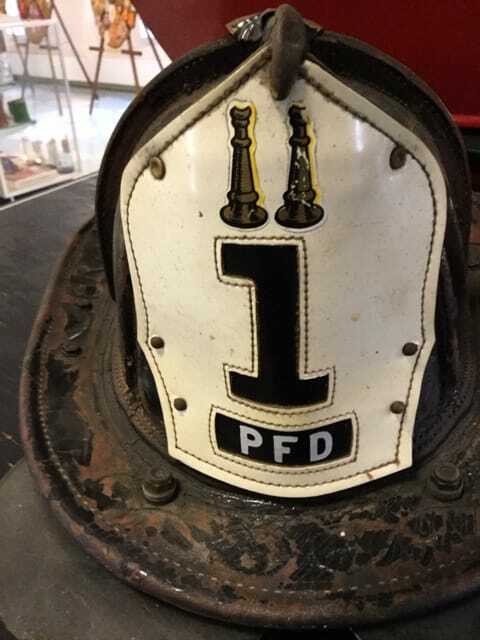 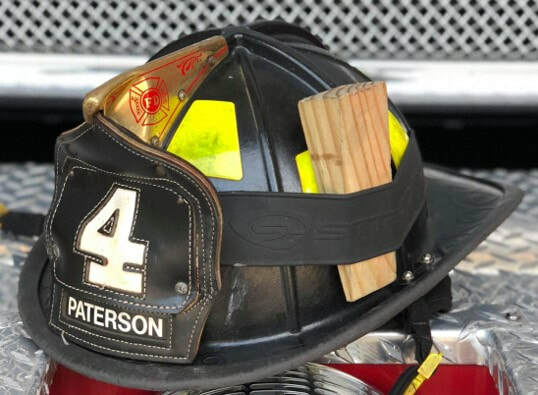 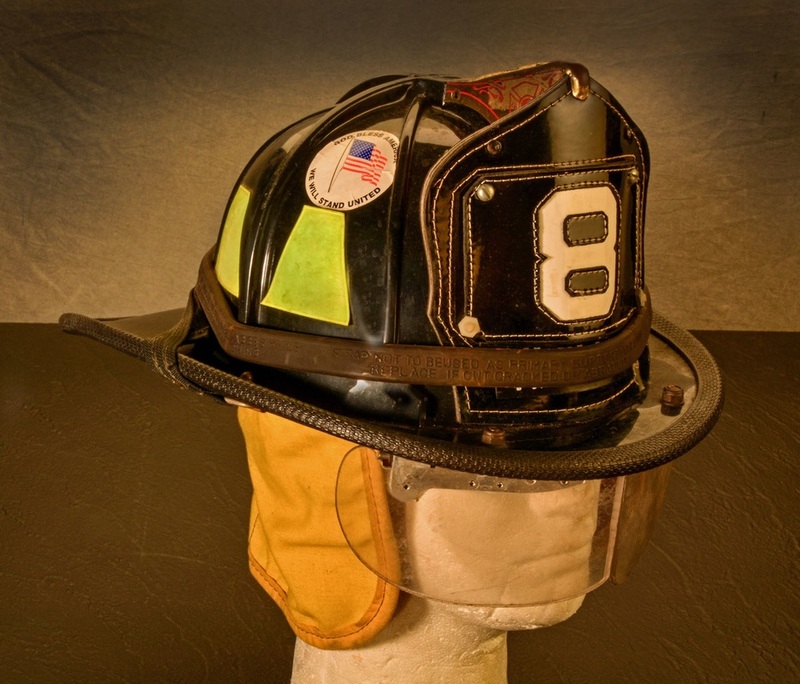 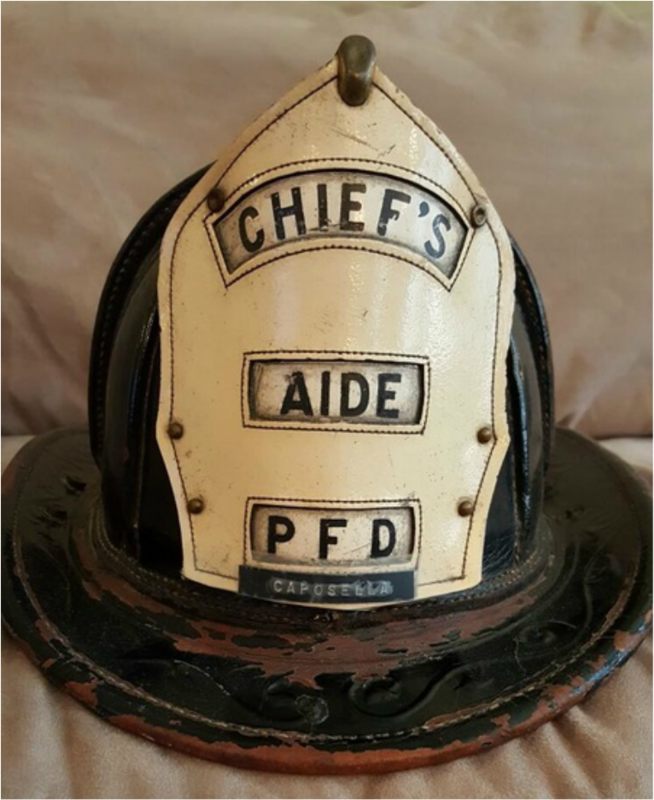 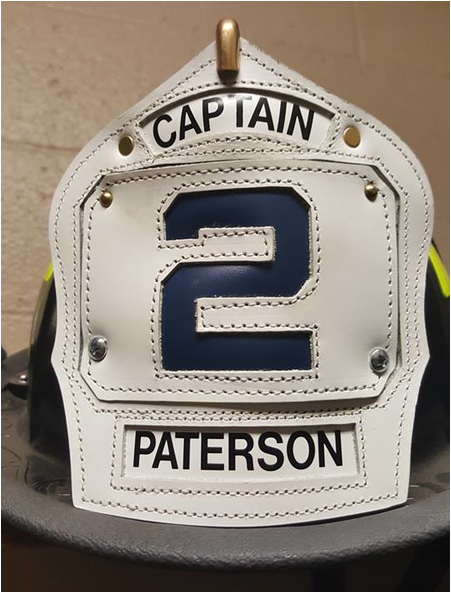 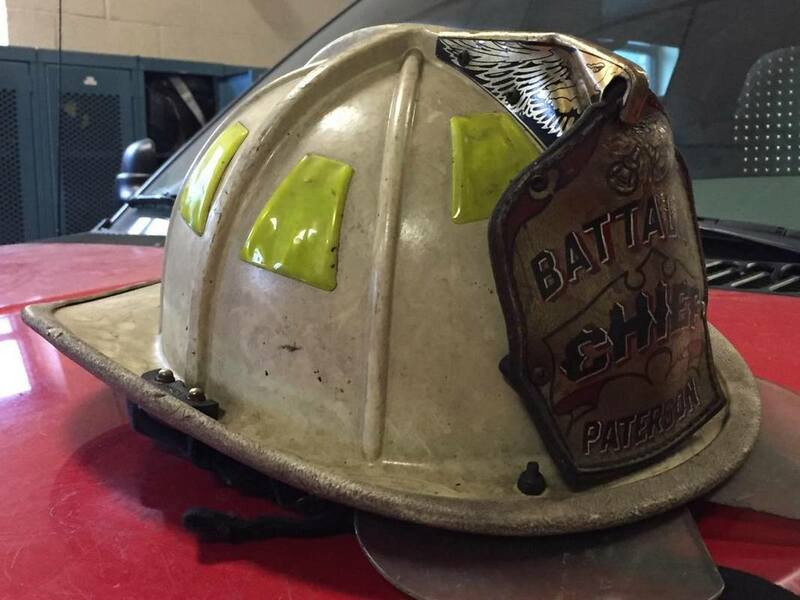 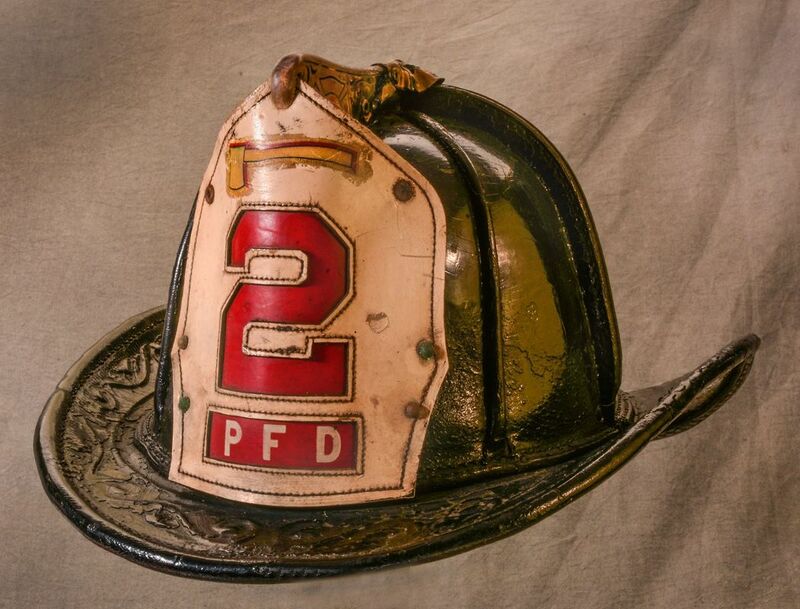 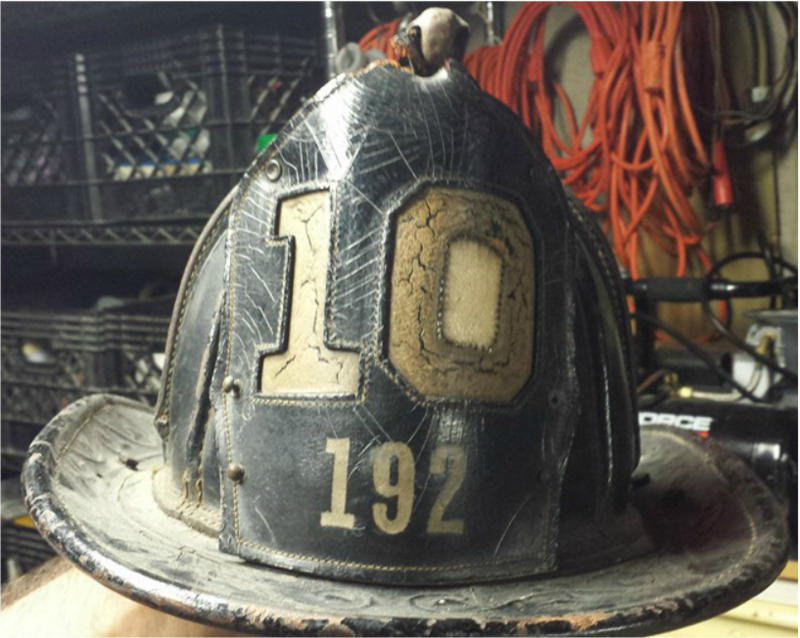 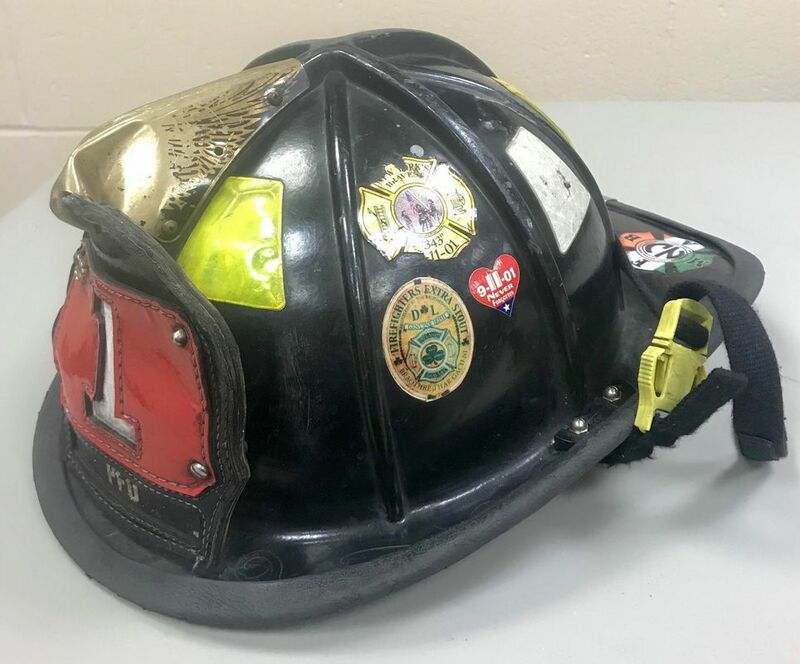 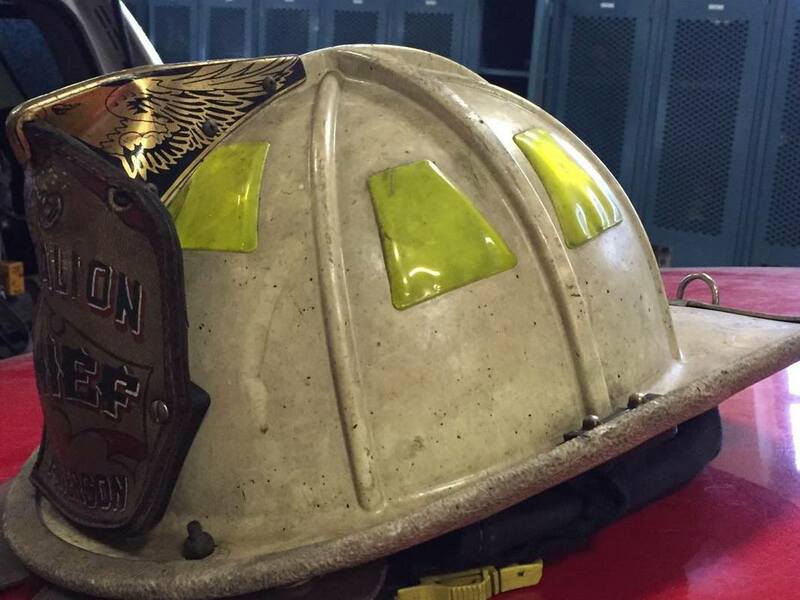 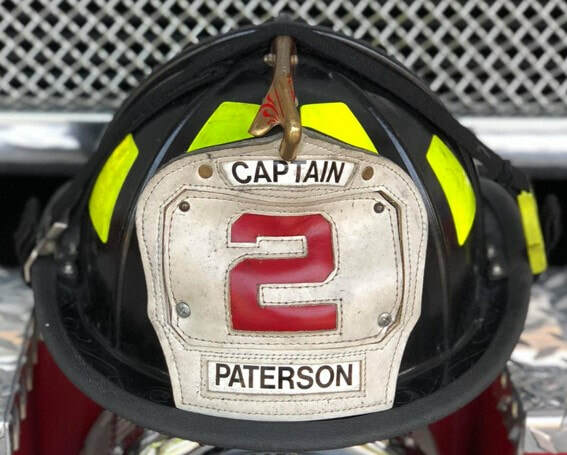 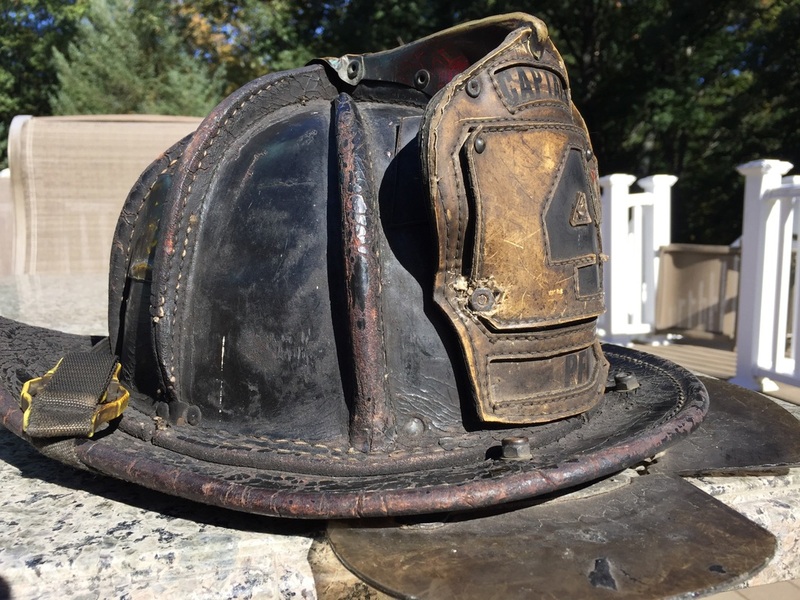 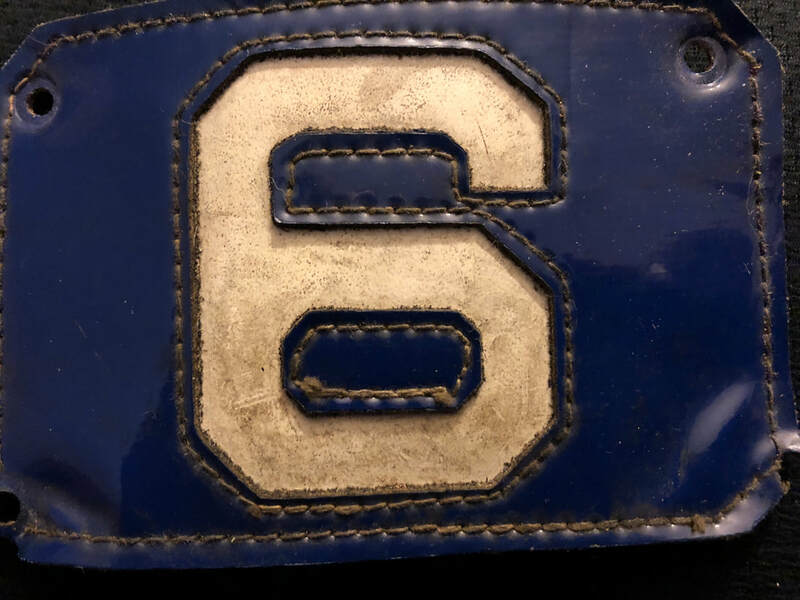 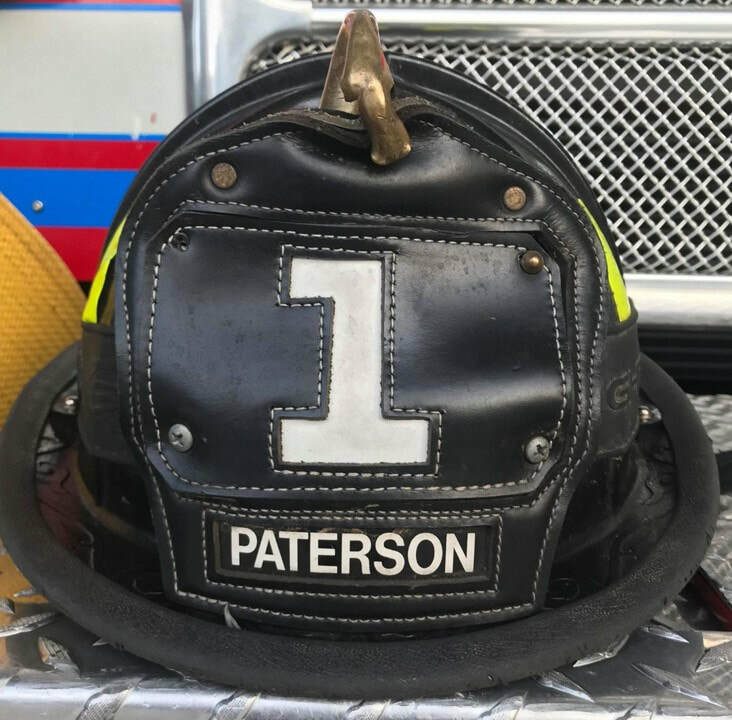 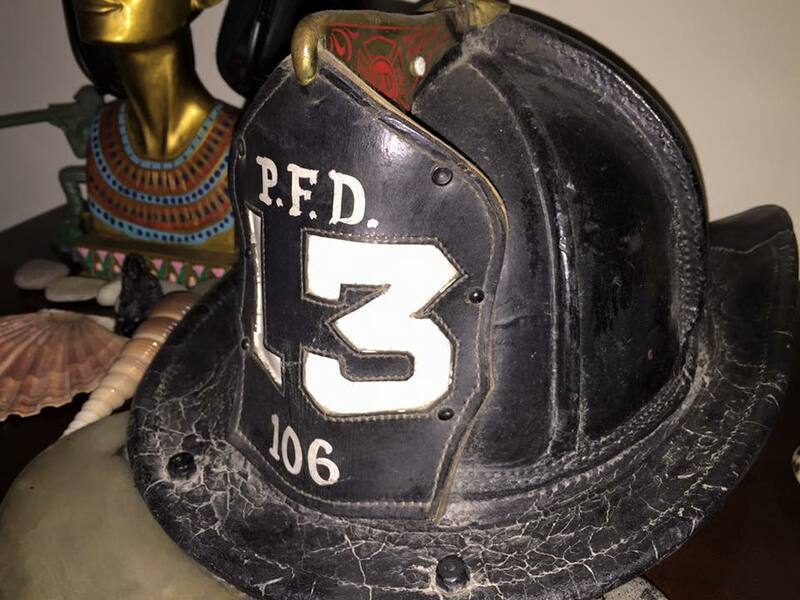 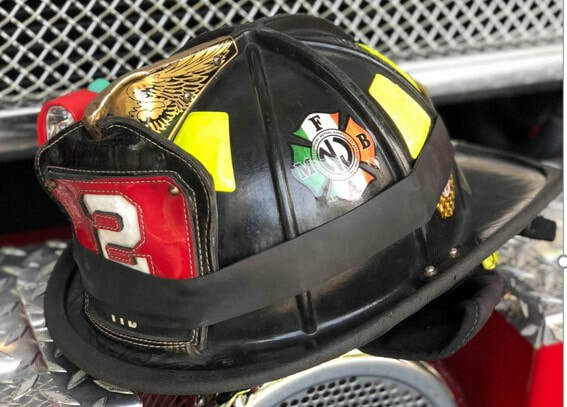 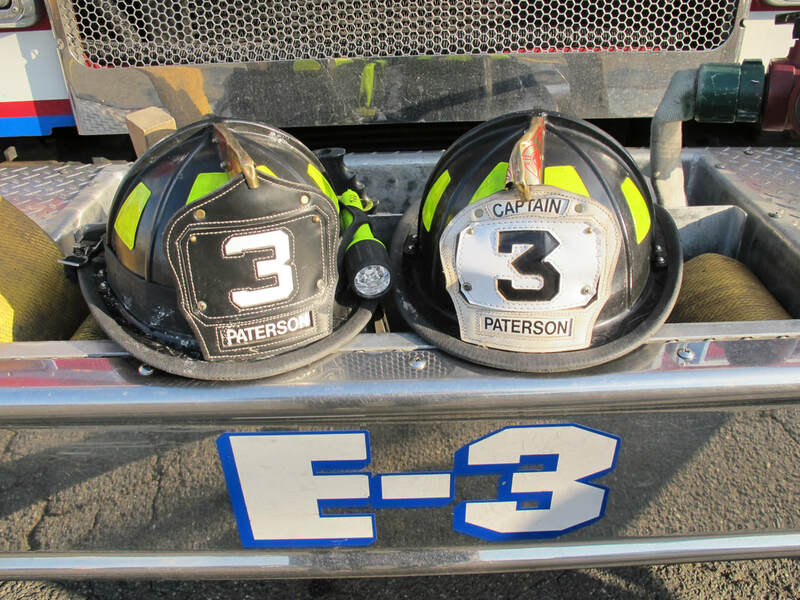 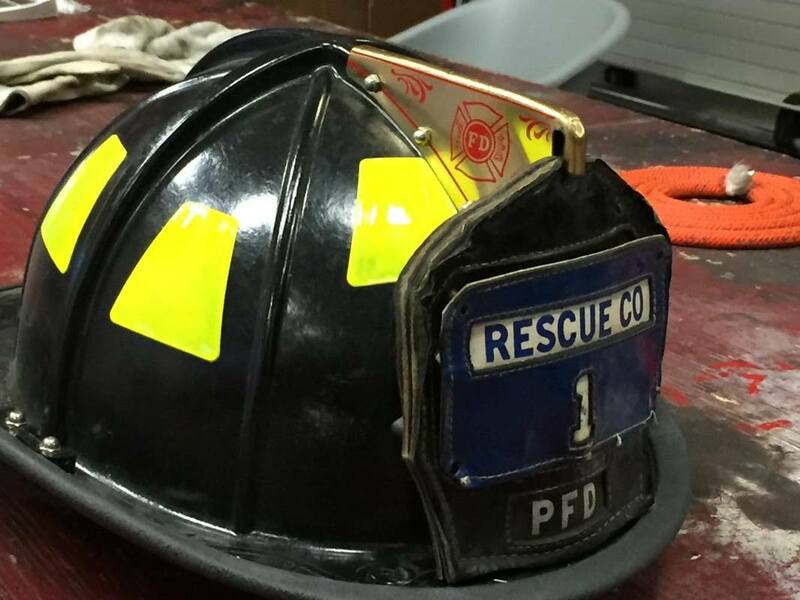 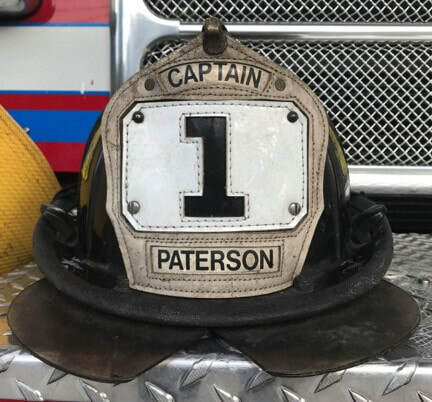 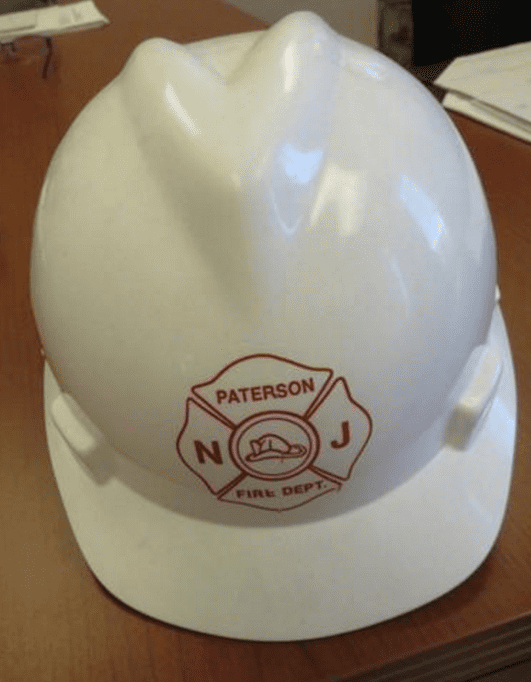 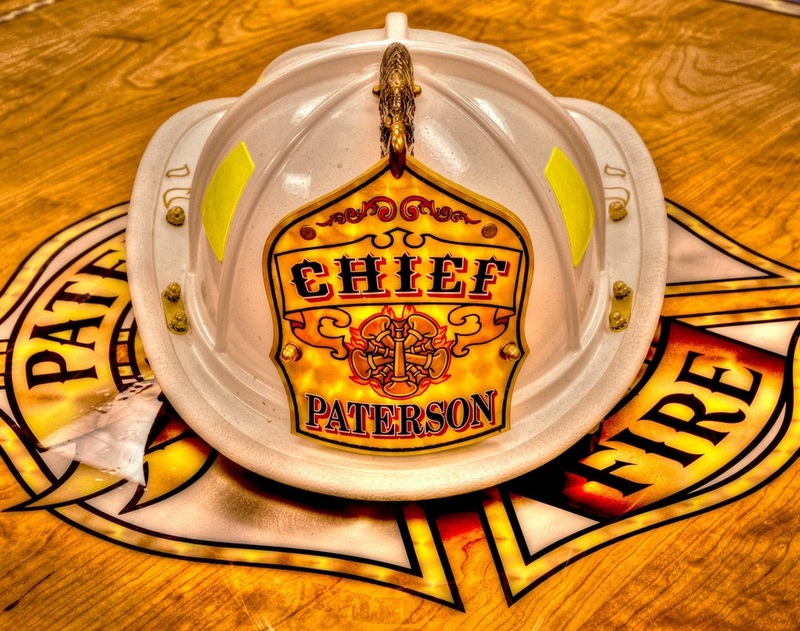 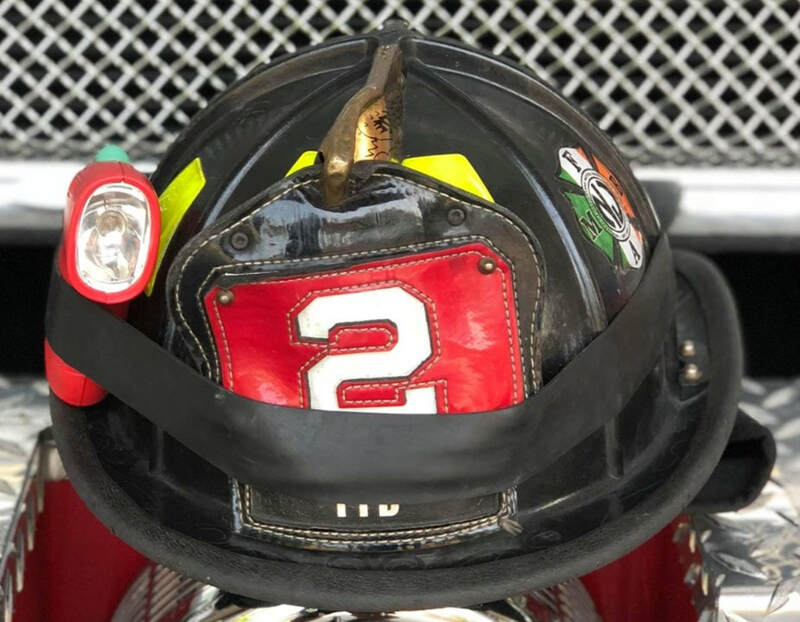 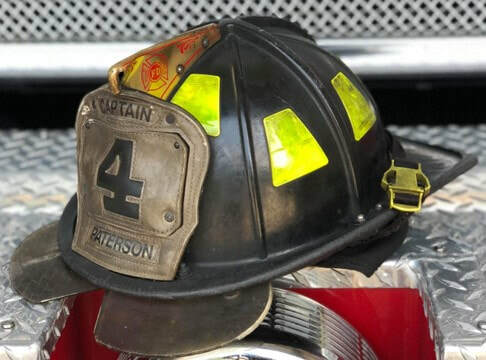 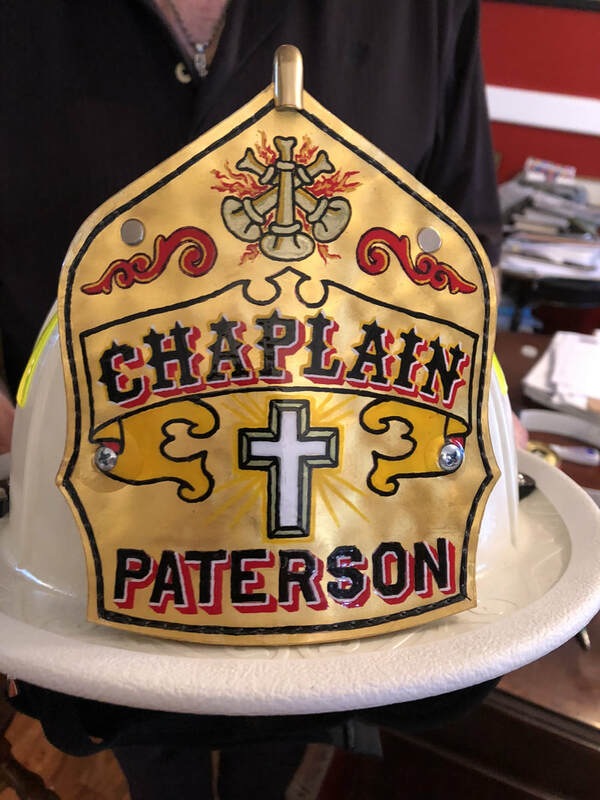 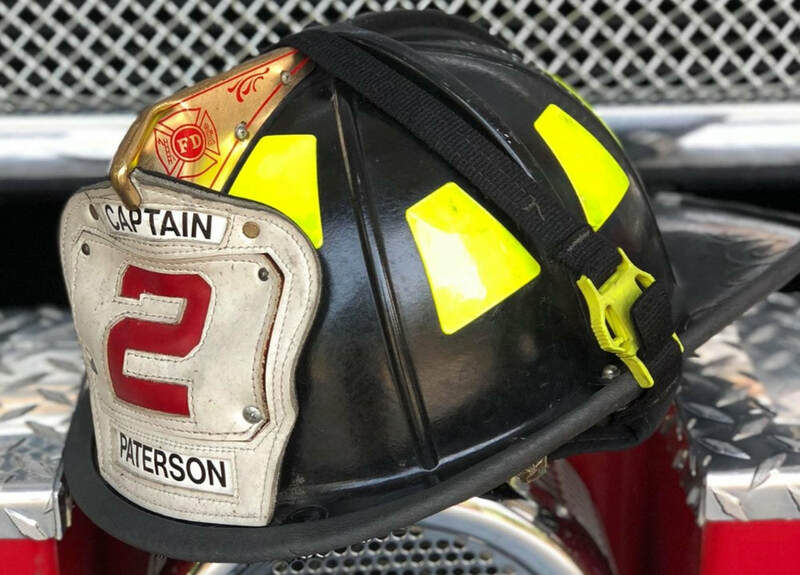 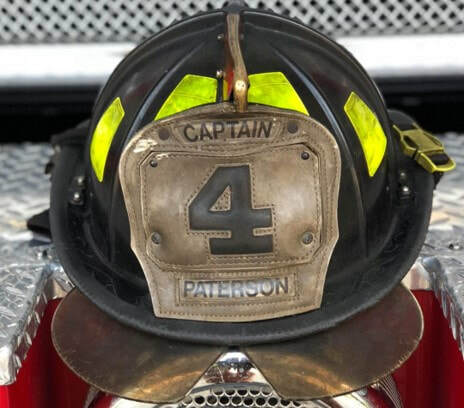 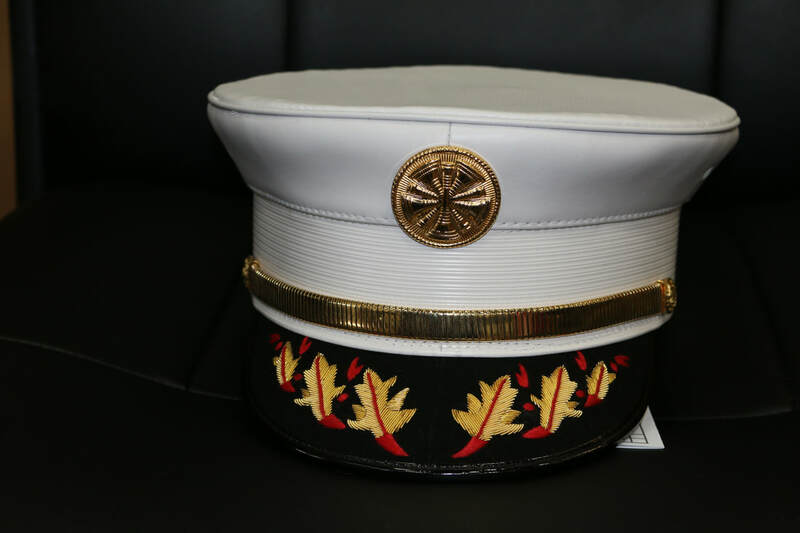 Over the years, including the Volunteer era, most Paterson Firemen have ordered their helmets from Cairns in Clifton, NJ. 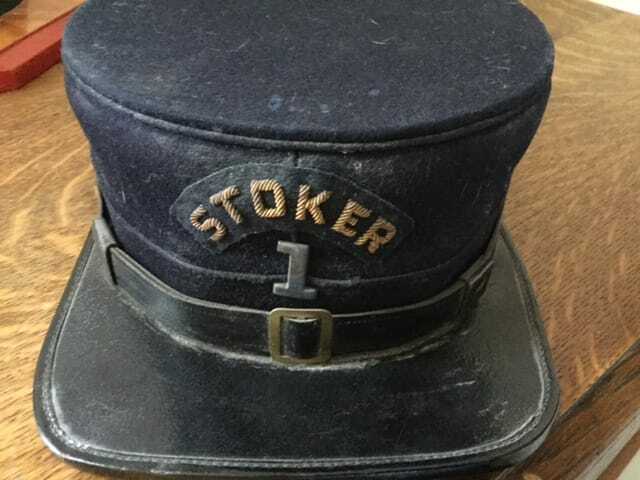 Over they decades that company created interesting advertising paraphernalia.